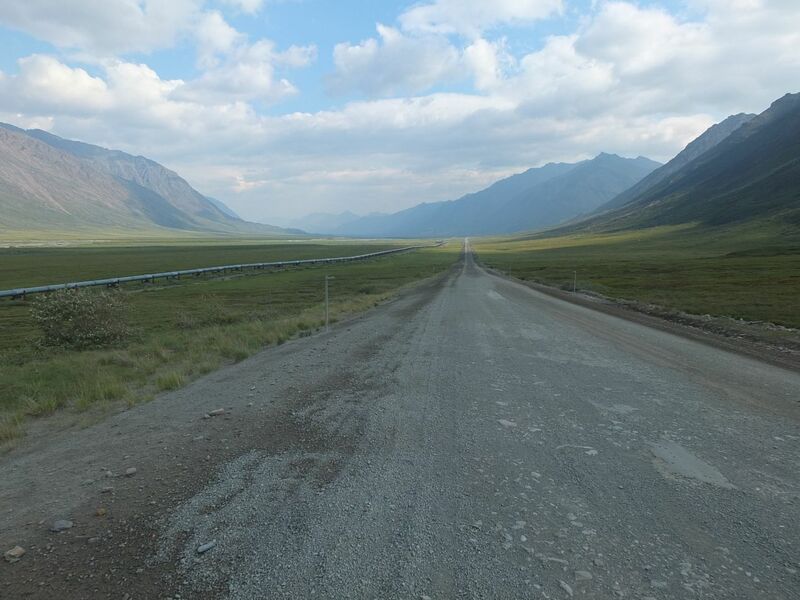 Quite aside from all of the other sights that I wanted to see on this trip, one of my goals was to rent a car and drive the Dalton Highway to the end of the line at the Arctic Ocean. 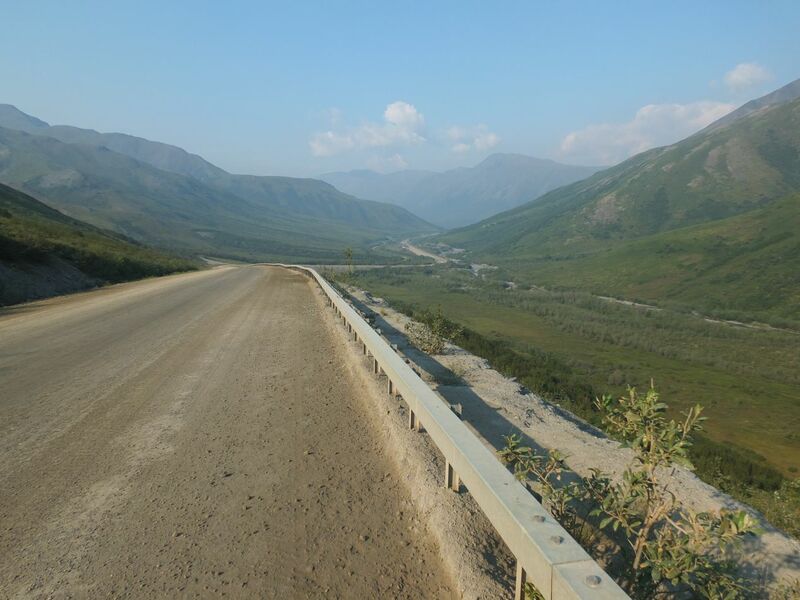 The Dalton Highway, also known as the Northern Slope Haul Road, is the route created to service the oil pumping stations at the top of the Trans Alaska Pipeline, and it's considered one of the most difficult and dangerous roads to drive in North America. It runs for close to 500 miles through forests, over mountains, and across the tundra before finally reaching the Arctic shores in the far north. There are very few stops and virtually no places for fueling or roadside services. This would be a true adventure, and I was eager to see what would lie in store on the road ahead. Driving on the Dalton is not a simple experience. 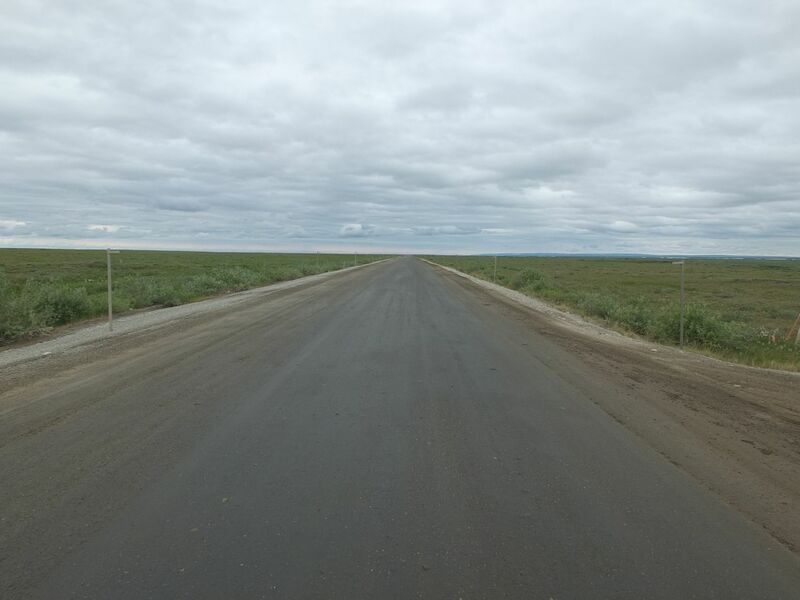 Much of the road is unpaved gravel and rental companies don't allow their cars to travel on the highway under normal circumstances. 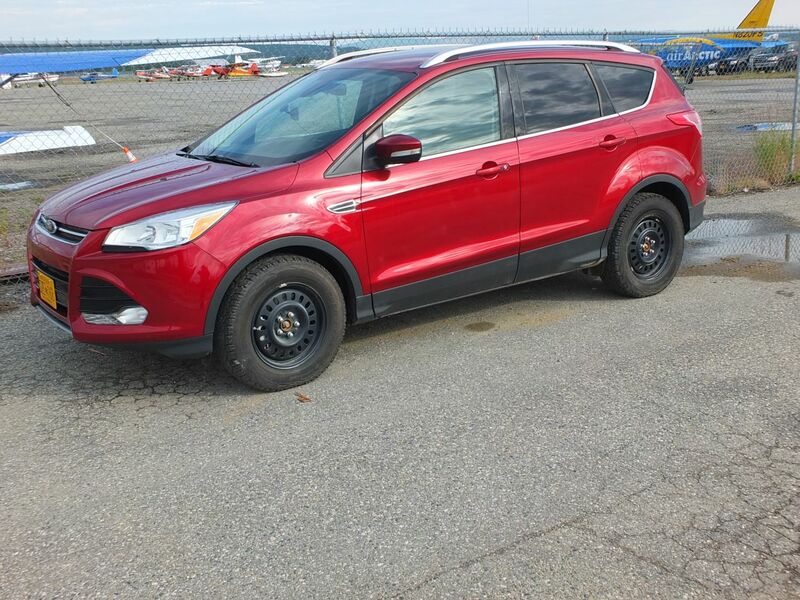 Having already rented one car down in Anchorage, I now had to rent a second car from a specialty outfitter specifically to do this drive, and it was not cheap. The car was kind of a hatchback setup with sturdy wheels, two spare tires, an emergency roadside kit, and a CB radio. 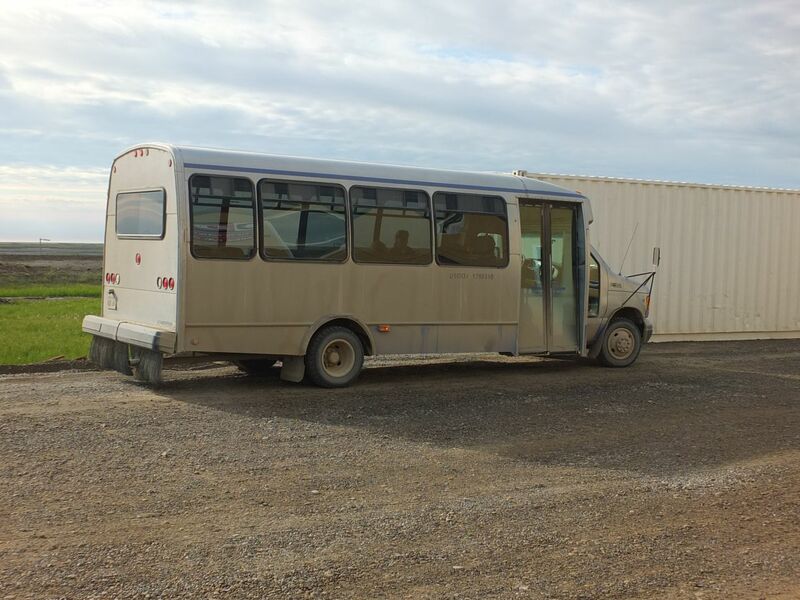 The Dalton is almost entirely used by truckers to run supplies back and forth to Prudhoe Bay, the location of the oil pumping stations at the end of the highway, and the truckers communicate exclusively through CB radio. I would end up listening in on many conversations during the long hours of driving, although there was rarely anything more interesting than "passing on your left" that came over the radio. 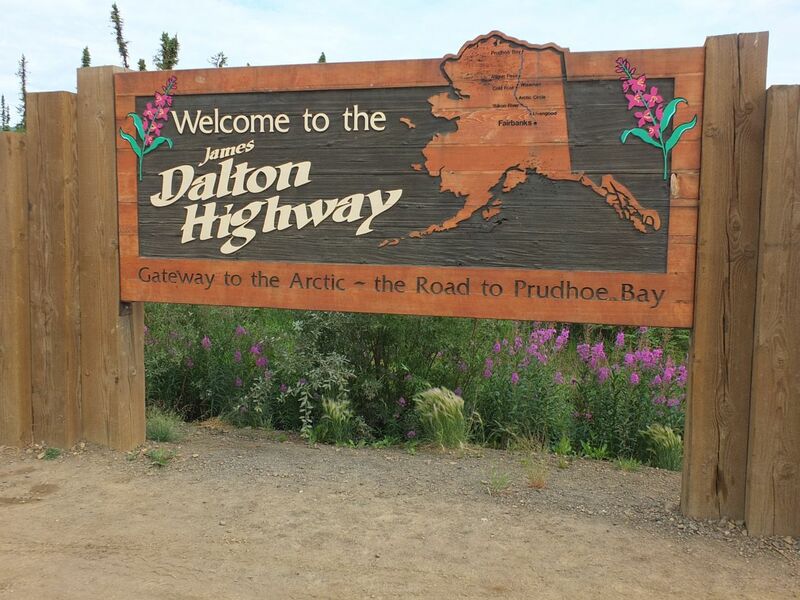 The Dalton Highway itself begins in Livengood a tiny hamlet with maybe 100 residents about 75 miles north of Fairbanks. 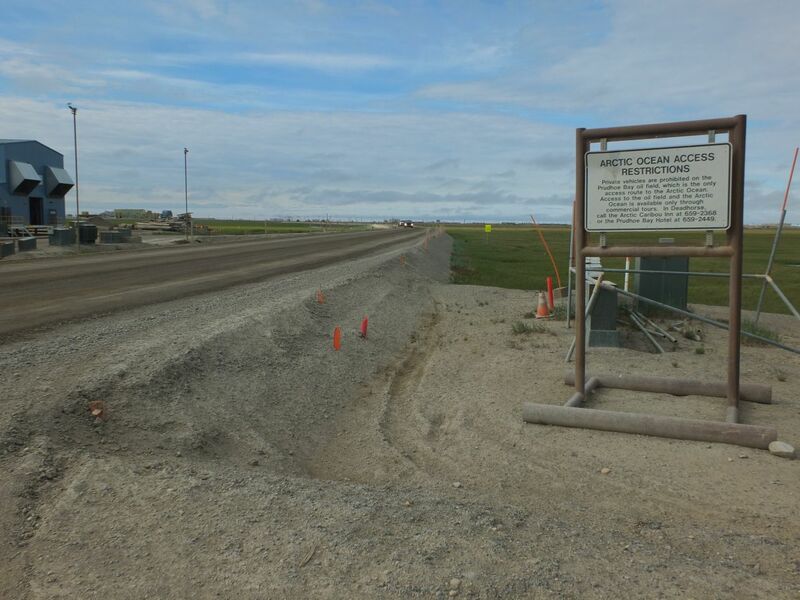 The road then runs for another 415 miles further north to Deadhorse, the name of the settlement just south of Prudhoe Bay where the workers at the oil fields are stationed between shifts. My car rental was for four days, as I knew that it would take two days to do the drive north and another two days to do the drive back south again. 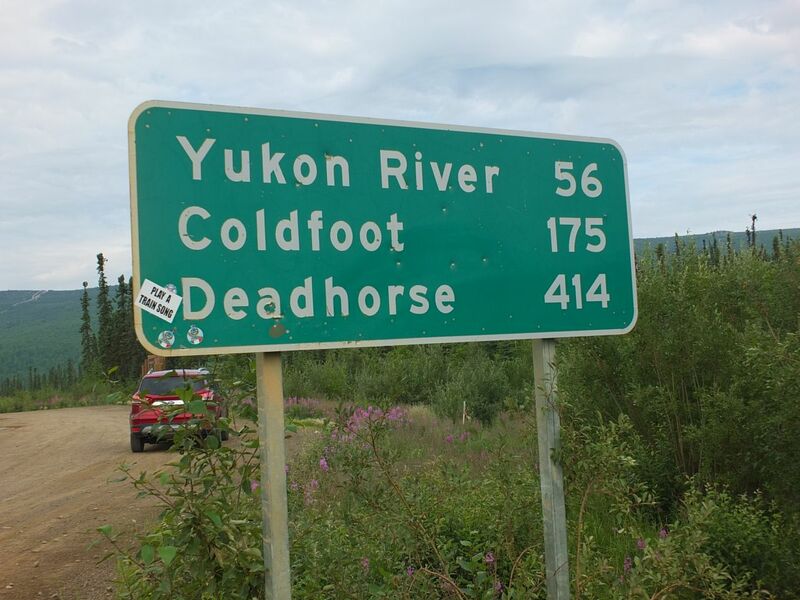 I would be staying at Coldfoot in between, a halfway stopping point just north of the Arctic Circle. Even with breaking up the trip across four days, this would be close to 1000 miles of driving, and not along good roads. With no one else present to split the driving time, I planned to stop frequently to take pictures and stretch my legs. For the first hour or two, this drive wasn't much different from hundreds of others that I had done. The road wound its way up and down hills through seemingly endless forests of pines. These evergreens were noteworthy mostly for their stunted size, usually not much taller than a person's height. The summer months are so short this far north that only the hardiest vegetation can grow in the soil, and the trees simply don't get very tall. 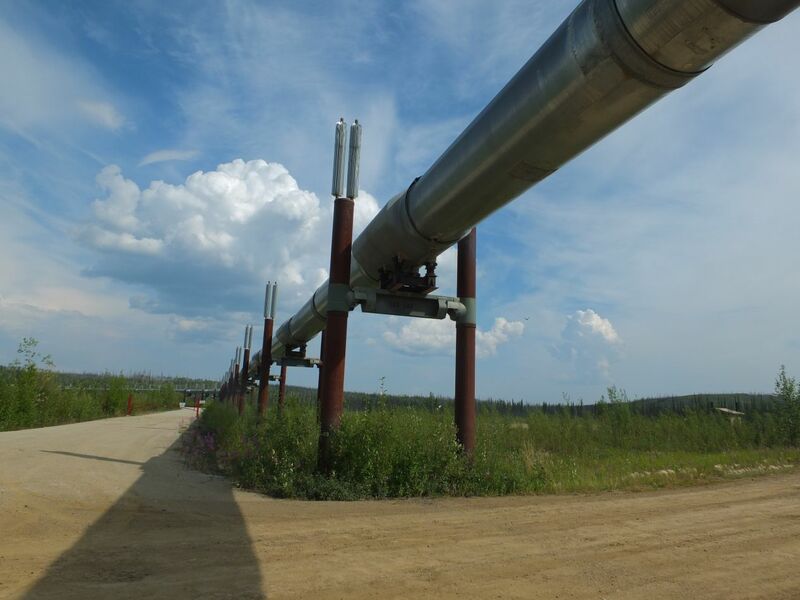 The other unusual element of this drive was the constant presence of the pipeline, which paralleled the road as it wound northward. That's the whole reason why the road exists at all, of course, as a means for servicing the pipeline. 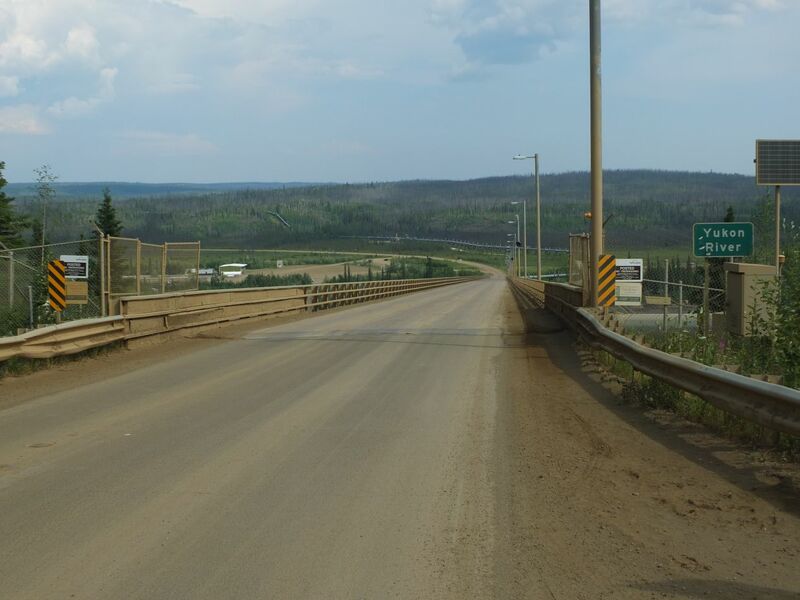 I learned up in Deadhorse that most of the people who work in the oil fields arrive there by plane, not by doing the drive up the Dalton. 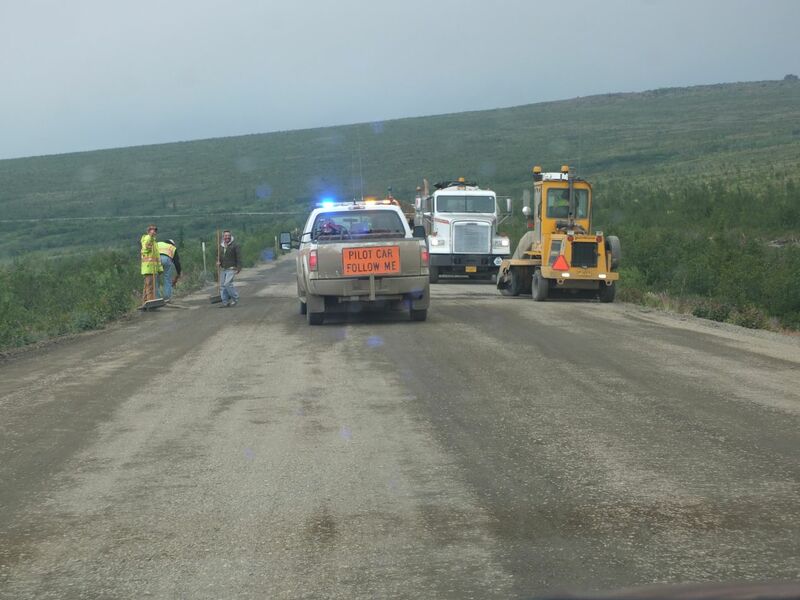 The road exists so that when something goes wrong along the pipeline, it's easy for crews to go fix it. For that matter, the Dalton wasn't even open to the general public until the 1990s. The fact that people can drive all the way up to the Arctic coast is something of an unintended side benefit. 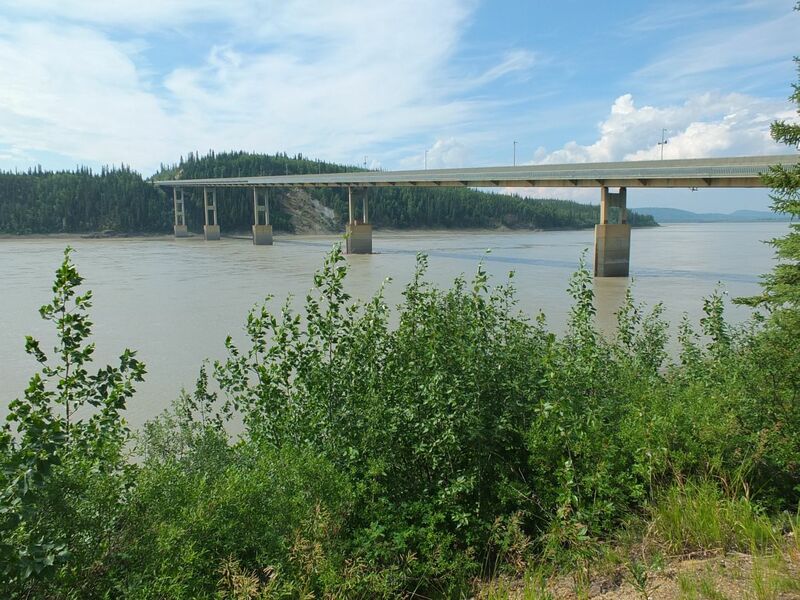 The first stop along of interest along the Dalton comes at the Yukon River crossing. The bridge across the river was one of the most difficult feats of engineering during the construction of the pipeline, and there's a small information stand with details about how it was made. 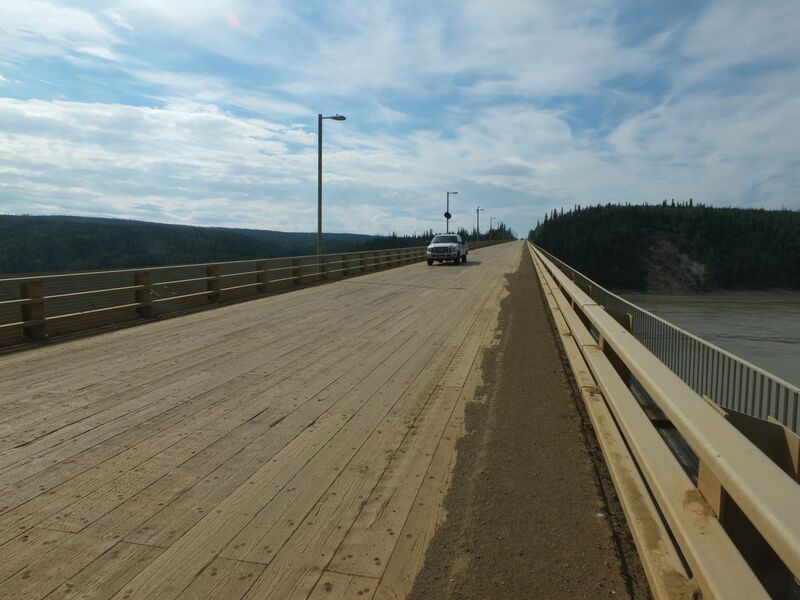 Even today, the bridge consists of wooden planking atop a concrete and steel base, and it lacks anything in the way of elegance or grace. This bridge is designed to be functional, and it serves its purpose well. 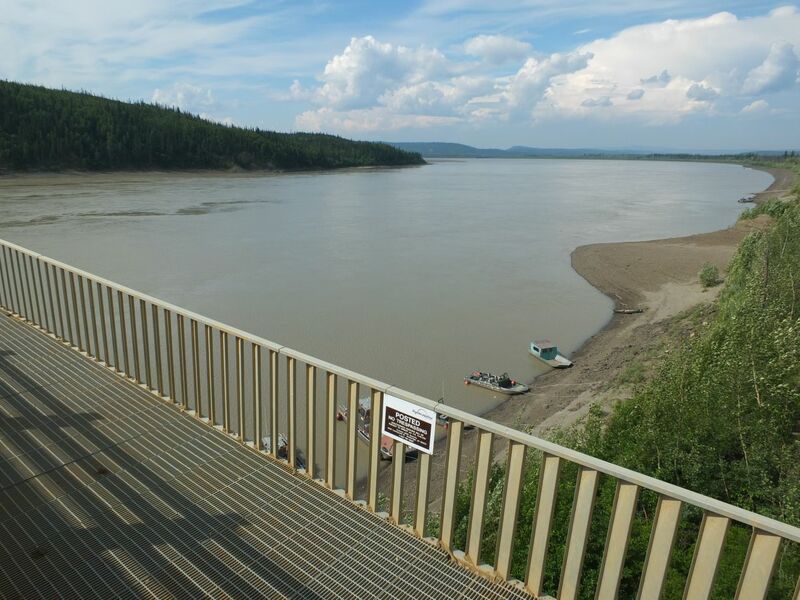 The Yukon River itself is surprisingly one of the longest in North America, running the full length of the state of Alaska from east to west and swelling to a great size by the time it reaches the Bering Sea. It freezes in the winter and has long been used as a method of travel atop the ice. 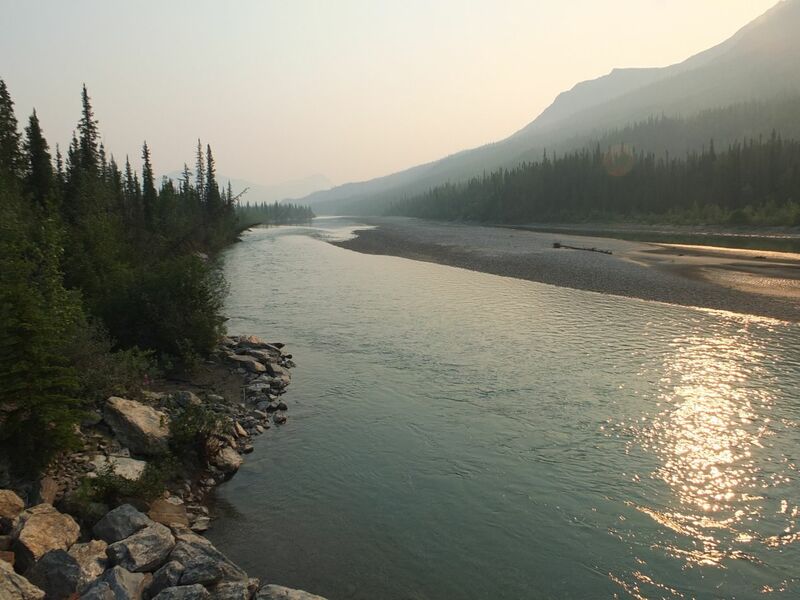 Here in summer it tended to look like most any other river, aside from running through such a vast stretch of empty wilderness. Still continuing to follow the pipeline north, I soon reached the official boundary of the Arctic Circle at 66°33' degrees latitude. 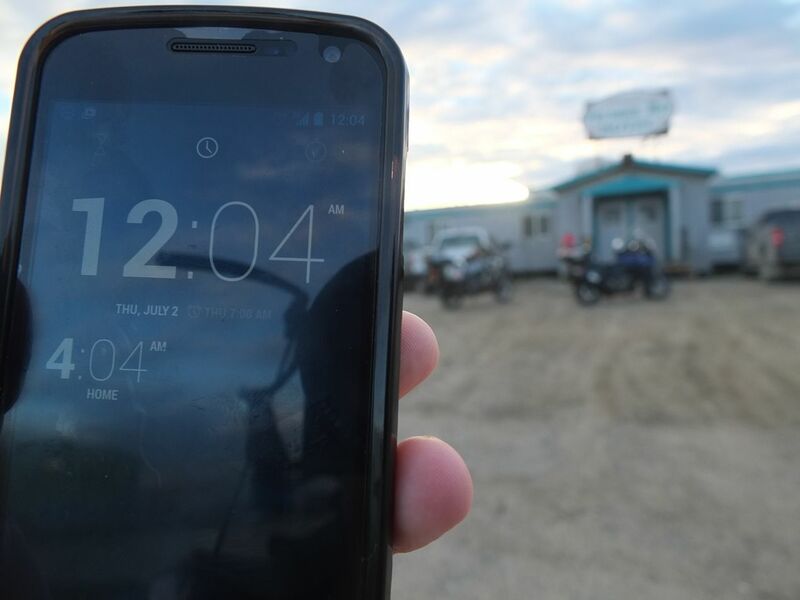 This is the northernmost point on the Earth's surface where the noonday sun is visible during the winter solstice, and similarly the northernmost point where there's any darkness at midnight during the summer solstice. Further north from here, there's permanent daylight in summer and permanent darkness in winter. This is all caused by the Earth's tilt on its axis, and there's lots of fascinating information about how the whole process works out there on the Internet. (One Wikipedia page explained that the Arctic Circle is not a fixed point because the Earth's axial rotation fluctuates slightly, and the Circle is moving north at about 50 feet per year at the moment.) For my purposes here, I had been getting short periods of darkness each night in my travels thus far, with the nights shrinking as I continued to move north. From this point on, I would be experiencing endless daylight for the next four days. 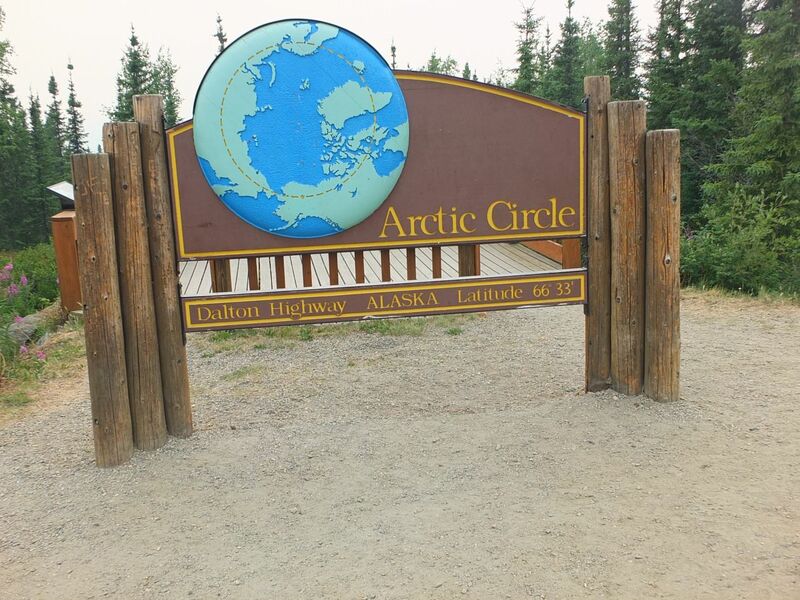 Most tours out of Fairbanks will take visitors up here to the boundary of the Arctic Circle where they can snap pictures of that sign, and then head back down to the city again. Very few people have the opportunity to head into the Arctic on their own as I did. The picture above also highlights just how little territory is encompassed by the Arctic Circle, with most of the Earth's surface above 66 degrees covered by the Arctic Ocean. There are very few places to travel and experience these sights firsthand, with this area in Alaska and the land in northern Scandinavia being the most accessible options. The other areas - the Canadian archipelago, Greenland, northern Siberia - are some of the most remote areas in the world. This was a rare opportunity indeed that I was getting the chance to experience here. Oh yes, there was plenty of construction and road work along the Dalton. 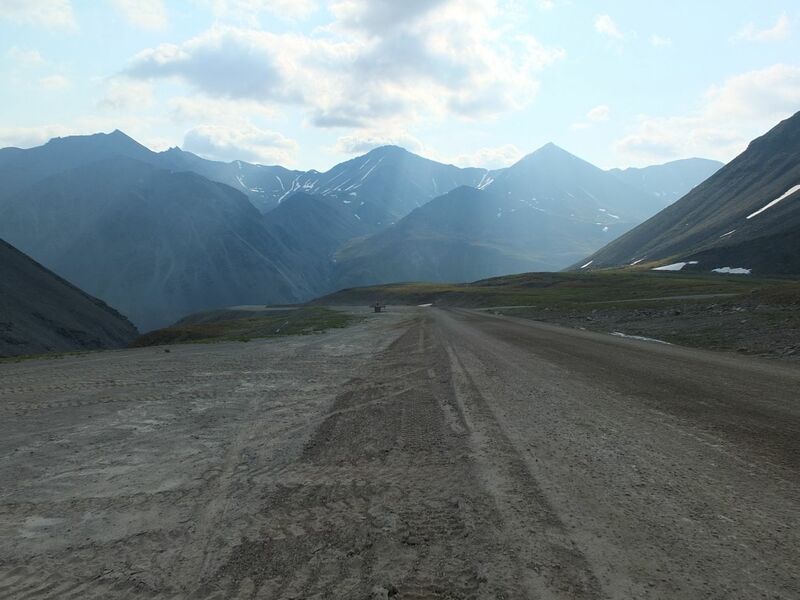 Like all the highways in Alaska, the summer months offer the best time to conduct repairs and the roads take a brutal pounding during the winter months. Most of the drive consisted of a quiet passage through pine forests, with many small rivers and lakes interspersed along the way. This area was heavily glaciated in the recent geological past, and those walls of ice have left a record of their passing behind. 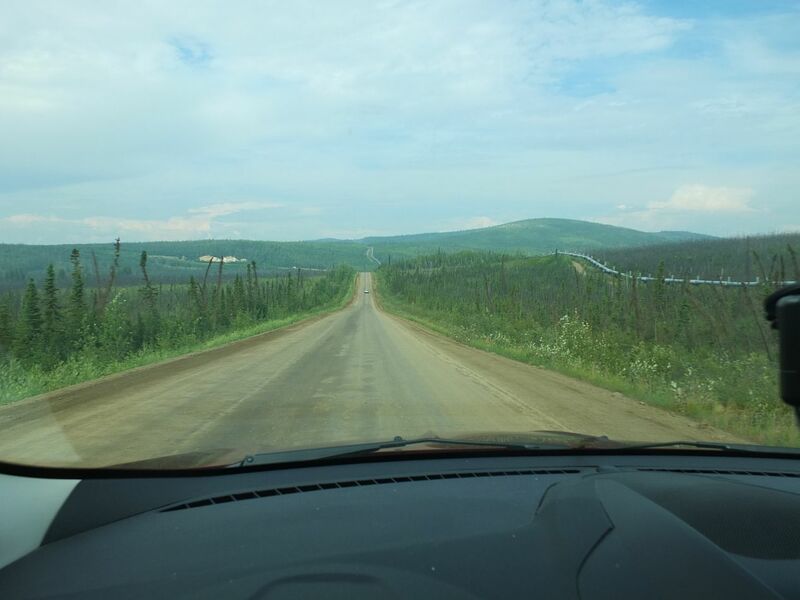 It was also roughly at this point in my drive that I spotted a bear, the only one that I encountered on this trip. It was a medium-sized black bear that darted across the road when I was pulling out from a stop. Caught by surprise, I was unable to get a picture in time before it scampered away. I've now run into bears in the Appalachian region of North Carolina, Cape Breton Nova Scotia, Yellowstone National Park, and two of them separately in the Canadian Rockies - they seem to be everywhere in the wilderness. It was too bad I didn't manage to capture this one on film. I reached Coldfoot in the late afternoon, the stopping point for this first day along the Dalton. 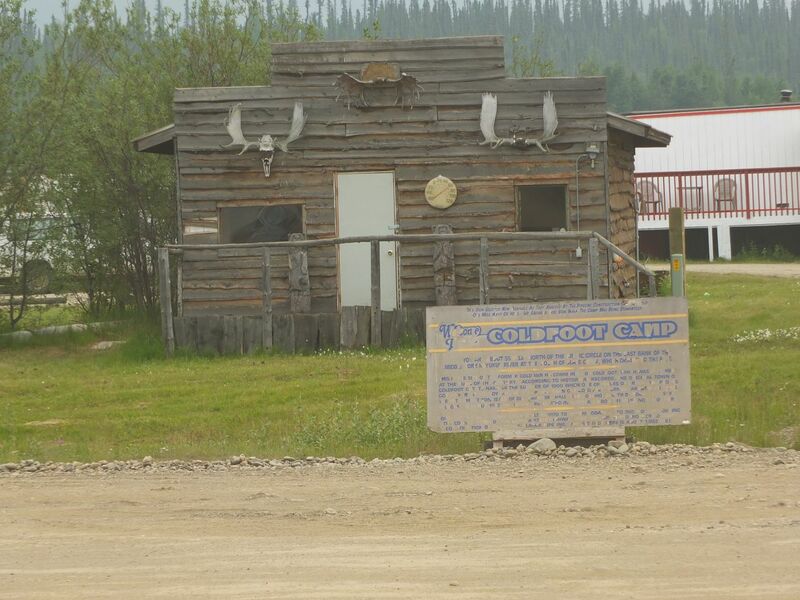 Coldfoot is a permanent home to only a dozen people year round, and largely serves as a rest stop for the truckers who pass back and forth along the highway with their cargoes. This is the last place to refuel with gasoline for the next 240 miles, which means that filling up is pretty much mandatory. 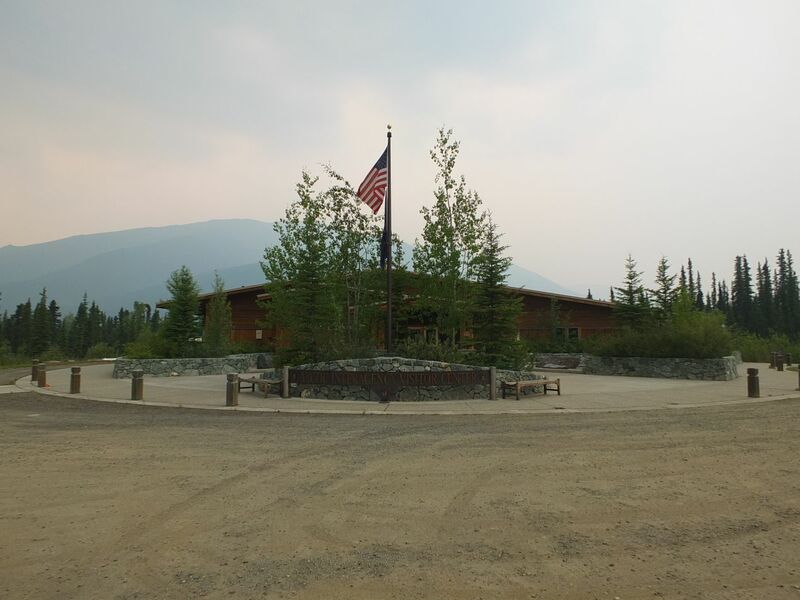 I stopped first to visit the Arctic Interagency Visitor Center, a surprisingly nice information center built by several different park and wildlife agencies. This building was constructed recently and it wouldn't look out of place in a national park like Denali. There were some well done exhibits inside explaining the astronomical phenomena that take place above the Arctic Circle, and a whole bunch of pictures and models about the wildlife that live in this region. The whole setup felt like it was too well done for this extremely remote area; I can't imagine they get more than a handful of visitors each day. The best part was a description of what happens to the visitor center in winter, when the whole building is buried under snow under the next spring. Needless to say, it closes for the year at the end of summer. Coldfoot Camp was a considerably rougher affair, and more fitting with this wilderness area. It was less of a town and more of a cluster of buildings grouped around the central historic post office, accompanied by gas tanks, an eating area, and an airplane runway. I have a picture of the post office above, which is still in use although appearing ready to collapse at any moment. Even the sign in front of it was falling apart and needed replacing. 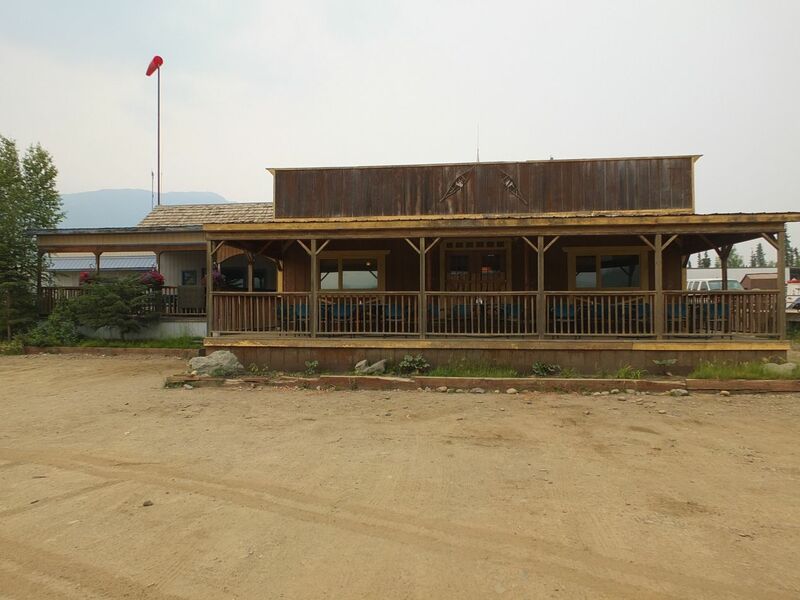 The largest structure at Coldfoot was the general store / restaurant, which was a no-frills affair but certainly serviceable. The dinners here were served buffet style, $20 flat fee to eat as much as you wanted from the food that was laid out in a spread. I have a picture of the dining area above, which continued the same outdoorsy theme of the rest of the place. Nearly everyone else in this picture was a commercial trucker stopping for the night; there were only one or two other groups of tourists in Coldfoot that I ran into. 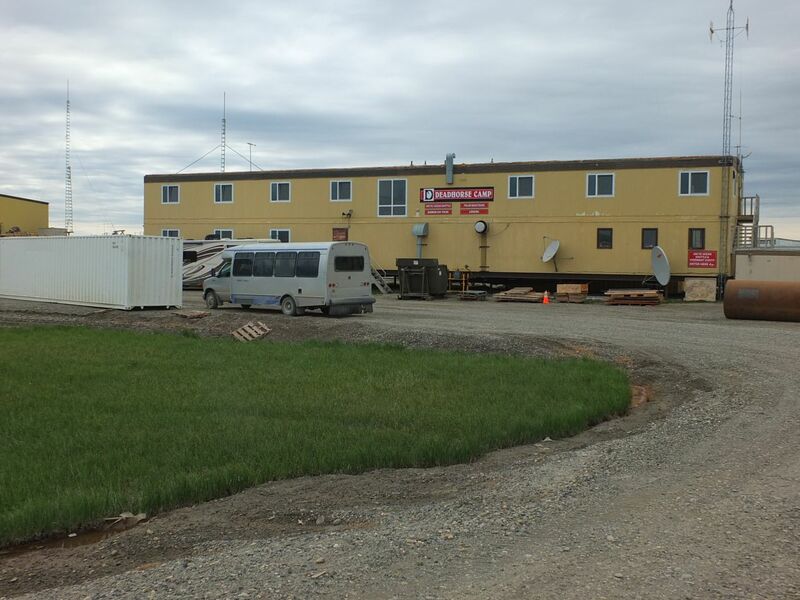 The accomodations here are also pretty rough, consisting of a small room in the prefabricated structure behind the dining area with a communal bathroom down the hall. There are no other places to stay, and the lack of any kind of competition for a hundred miles in any direction causes Coldfoot Camp to charge astronomical rates: over $150 to stay per night. I said no way to that and paid the $8 fee to use their showers, then slept in my car. The next morning dawned under a cloudless sky but with a bit of a haze in the air. This is apparently not unusual, and comes as a result of smoke from wildfires that travel huge distances. 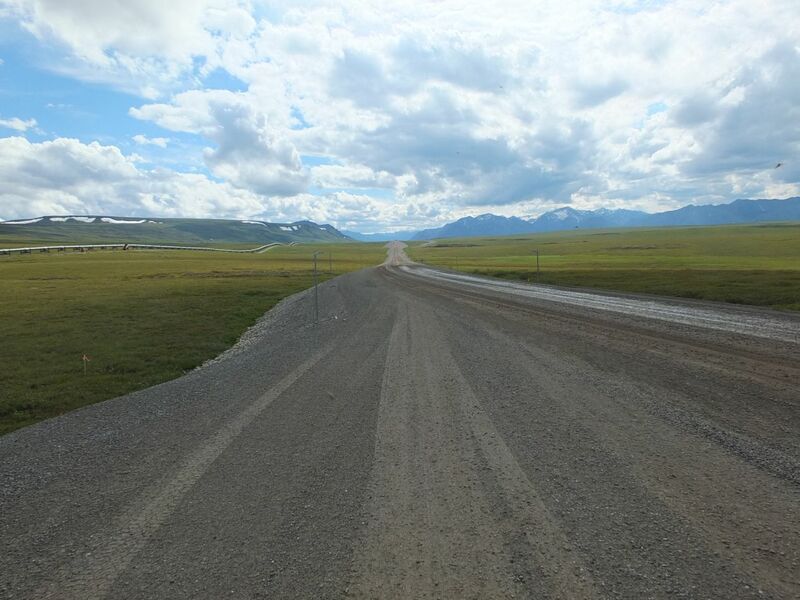 The gravel road continued onward ever northwards, as I continued to cross over rivers and hills. I saw few other vehicles on the road and took my time driving, both for safety's sake and to drink in the scenery. 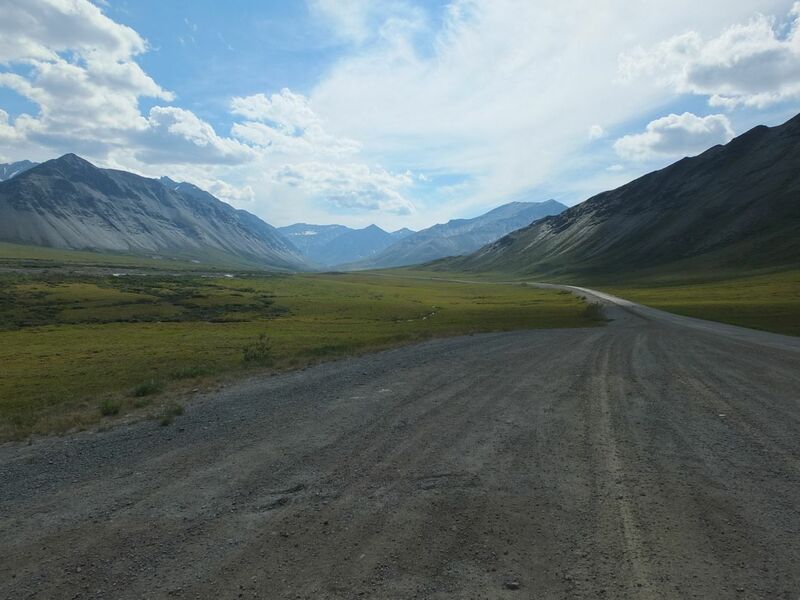 The land was truly gorgeous and aside from the Dalton Highway and the ever-present pipeline, it was untouched by human hands. There were no cities or towns, no stores or places to stop, not even individual family farms. While this land would be blanketed under snowfall for much of the year, here in summer it was a sea of verdant green. There were fewer trees as I continued north, but lots of grasses and wildflowers grew near the road's edge. Small rivers and ponds dotted the landscape, with the larger ones requiring their own bridges. I was taking it easy and enjoying the drive through this unspoiled landscape. 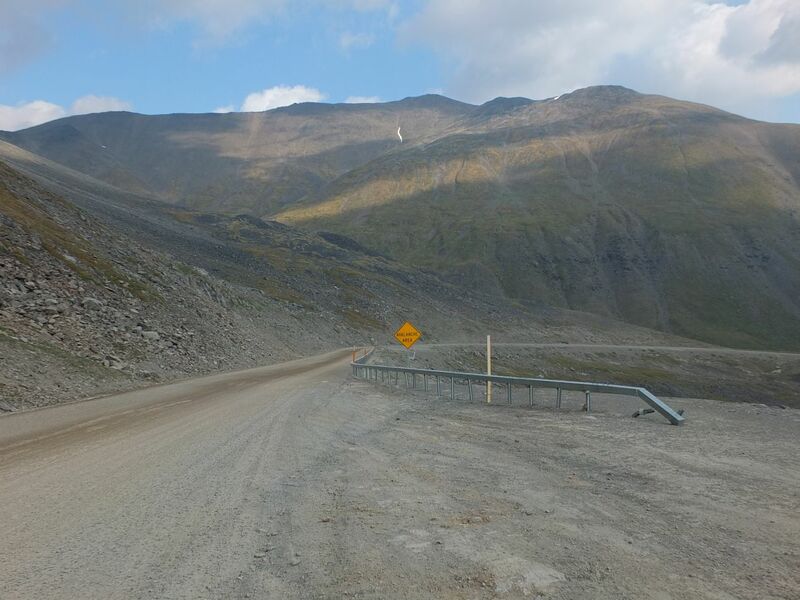 After a few hours of driving, I reached Atigun Pass where the highway traverses the Brooks Range. On a map of Alaska, this is the northernmost range of mountains, although significantly shorter in elevation than the ones down by Denali. 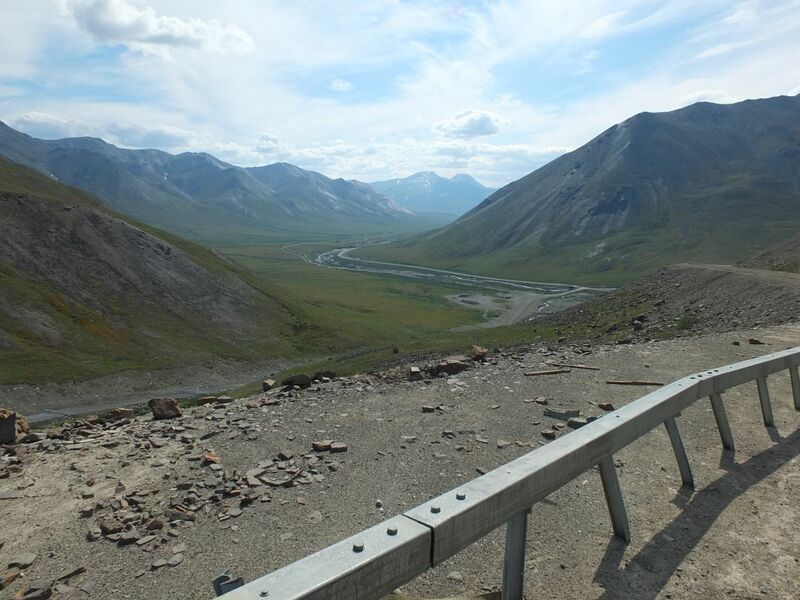 Crossing them is still a tricky feat though, and the same mountains off to the west are part of Gates of the Arctic National Park. I would have gone there to see more of the scenery, except that the park has no roads or trails at all, and can only be accessed via plane. Here on the Dalton, the road tilted upward sharply, snaking back and forth as it gained several thousand feet in elevation. 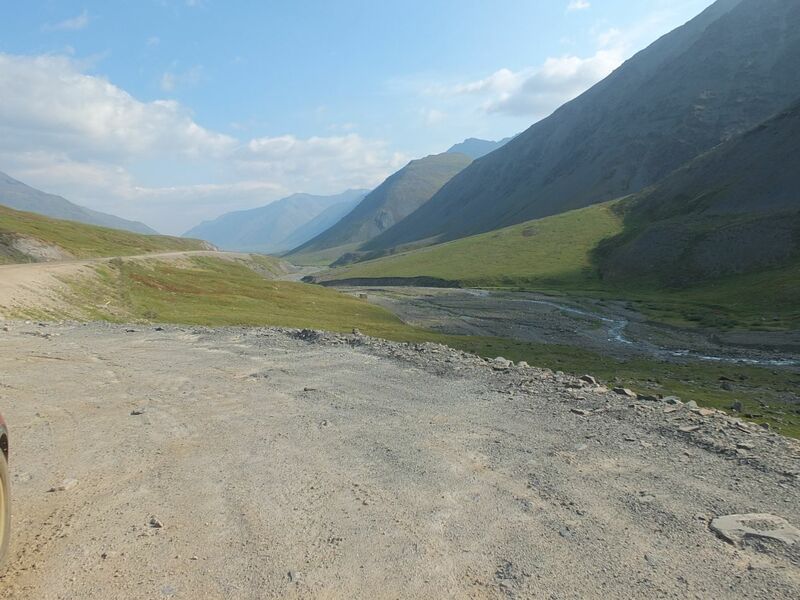 The vegetation dropped away completely as I climbed, leaving Atigun Pass with nothing but bare rocks and gravel. Snow clung to the surrounding mountains, laying in patches here and there that fell out of the sunlight. This is the most dangerous part of the Dalton, and I don't even want to imagine what driving through here would be like in winter. This is the most common place for accidents to take place, and people die on the Dalton every year. Fortunately summer is a very different story than winter, and by driving slowly and keeping a sharp eye out, I didn't feel as though I was in any particular danger. The scenery in the mountains was a nice break from what I had been seeing thus far in the valleys below. 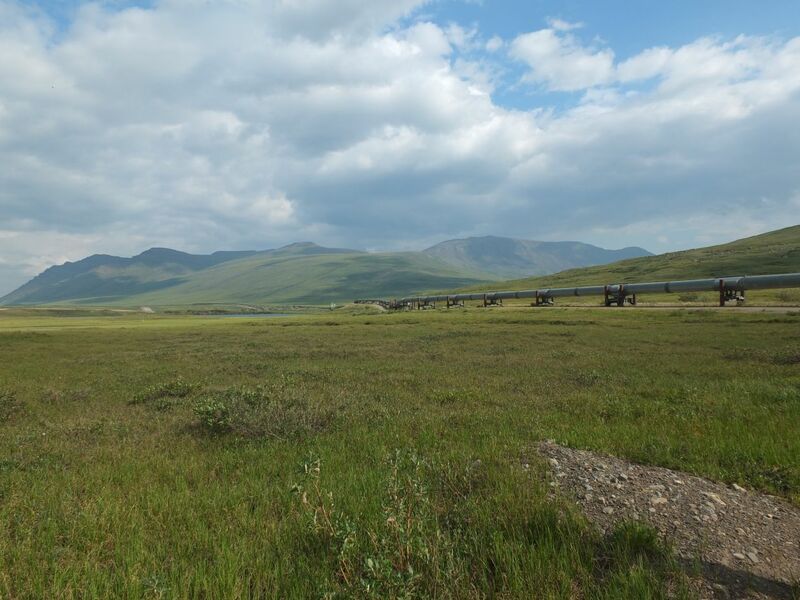 On the north side of the Brooks Range, officially known as the North Slope, lay the tundra. That's a word that most everyone is familiar with (and is a terrain type in Civilization), but few people have ever experienced firsthand. 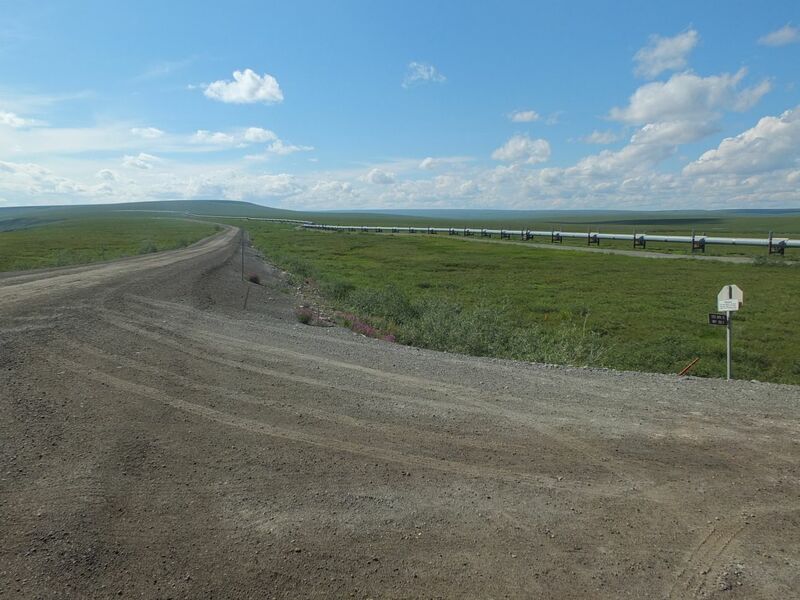 The highway runs on an elevated causeway through the tundra, and that was the best way to think of the road in this region, as a causeway. Passing through the tundra was surprisingly similar to passing through a swamp; for one thing, the tundra is a wet environs in the summer. 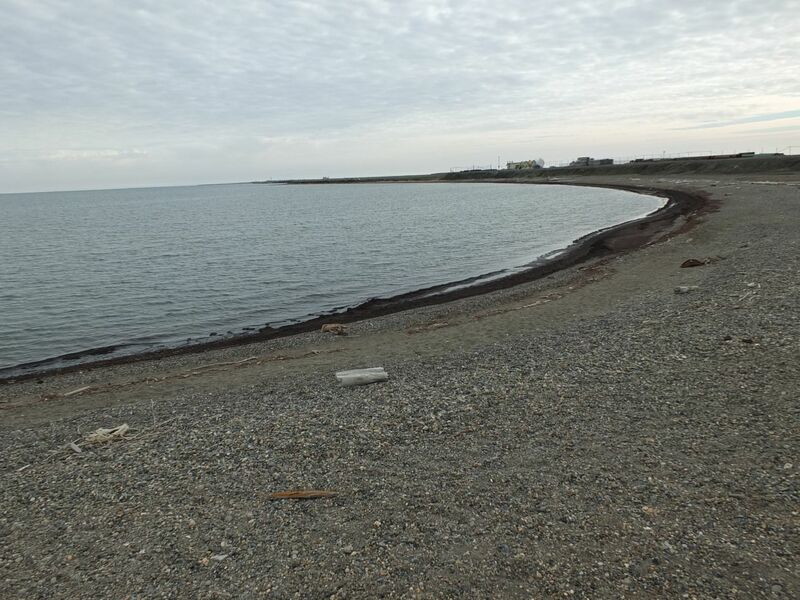 Because permafrost is located just below the surface, there's nowhere for water to go when the snows melt, and it ends up sitting around on top of the ground in small pools everywhere. The water is also a breeding ground for one of the other surprises of the tundra: swarms of insects. They're everywhere in the summer, and they make spending any amount of time outside in the tundra profoundly unpleasant. Those bugs are the key to this region's ecology though, living brief lives in the summer months to be snapped up by birds and rodents, which are then prey for the larger predators. All of the animals must eat voraciously during the brief warm period to be prepared to survive the long months of darkness that follow. The tundra was therefore not what I had been expecting at all. I was used to thinking of tundra as a bare, empty patch of gray terrain that doesn't provide enough food to support cities in the Civ games. 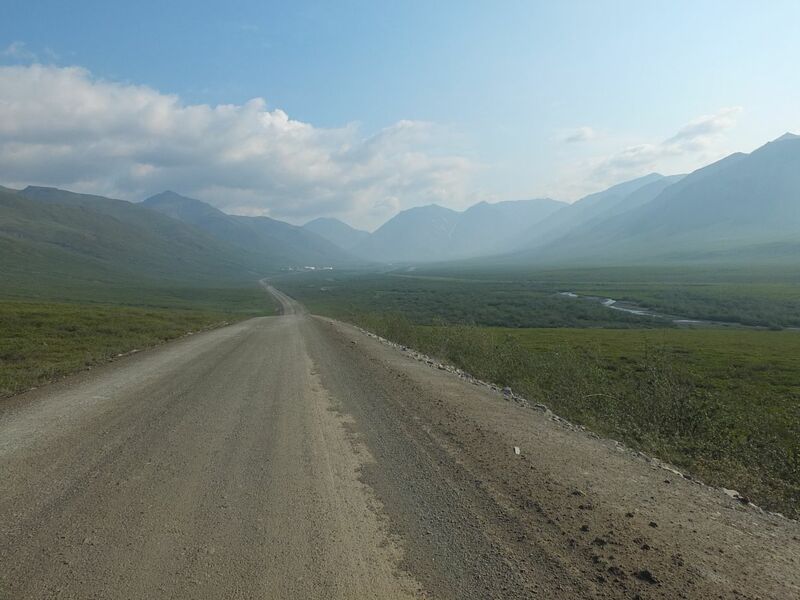 Here in the summer though, the tundra was a vibrant ecosystem teeming with life, and the muddy grounds really were reminiscent of being in a swampy region rather than above the Arctic Circle. Unlike a true swamp though, the tundra was cold and dry; there was no humidity in the air, and this area gets very little rainfall. Almost all of the water on the ground comes from melted snow and ice, not from natural rainfall. There was also the constant wind, which blew south from the ocean in an unending whisper through the stubby grasses. With no trees and relatively flat terrain north of the Brooks Range, there was nothing to stop the wind from whipping about. I had thought that I might want to walk around in the tundra a bit, but the conditions were such that I was happy to stay inside my car, which frankly was better for the environment anyway. Not what I was expecting at all. 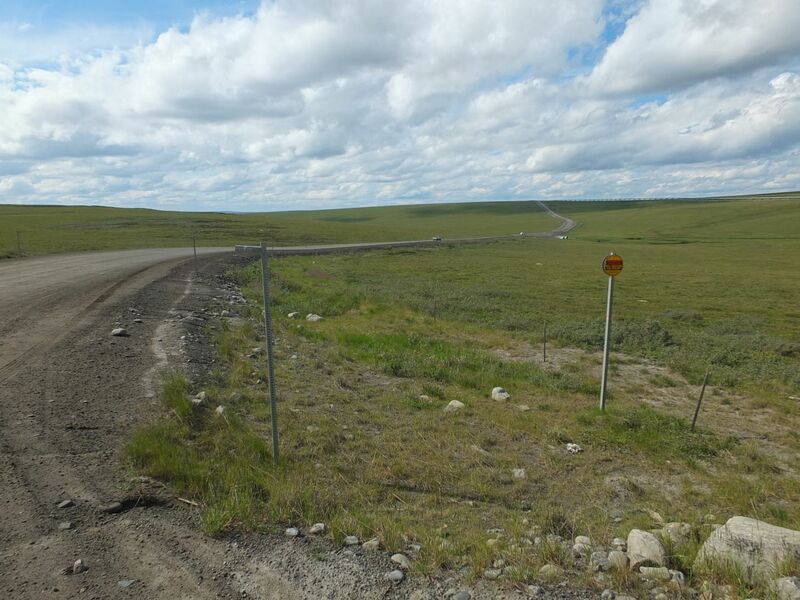 Deadhorse is visible for several miles before reaching it along the final stretch of the Dalton Highway. 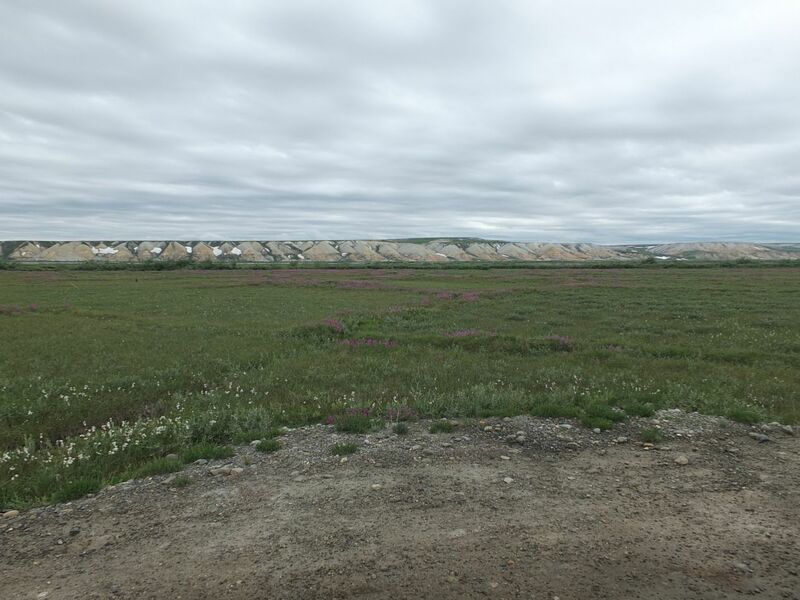 The rough prefabricated buildings are rarely more than a few stories in height, but the surrounding tundra is so flat that they're visible from a great distance. 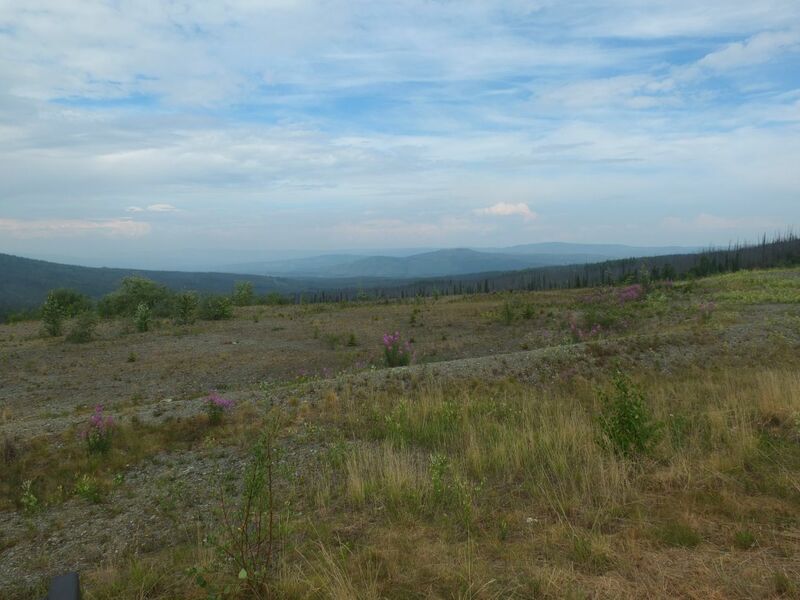 After driving through so much wilderness, any sign of human habitation stood out like a sore thumb. Deadhorse was much more populated than anywhere else I had visited north of Fairbanks, with several thousand workers present to service the oil fields at any one point in time. It was very much a work camp, kind of like a giant version of an offshore oil rig where everyone present is involved with running the operations in some capacity. There are no families living here, no shopping malls or retail spaces to go explore. Everyone and everything is engaged in industrial activity of some kind. Trucks and heavy machinery dot the landscape, with giant drills and cranes more likely to be spotted than a coffee store or any similar urban comforts. Because it's more expensive to remove outdated equipment than keep it in place, there's a lot of older drilling equipment that's been left largely abandoned, and Deadhorse has grown up in ramshackle fashion over time, as successive oil companies have set up operations, extracted natural resources for a while, and then shut down when the market turned against them. I imagine that this is what a frontier town in the Old West would have looked like a century or more ago, everyone looking to make their fortune and not worrying about much else. 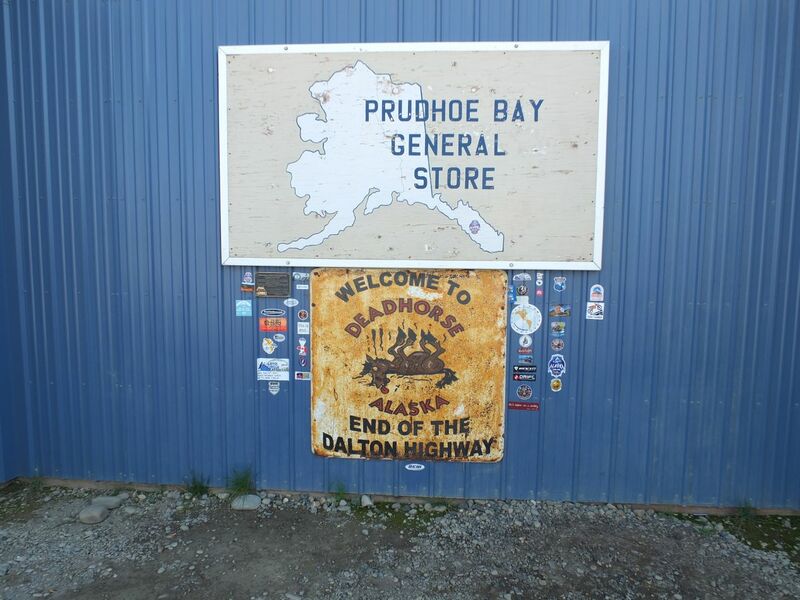 The Prudhoe Bay General Store is the only commercial establishment in Deadhorse. 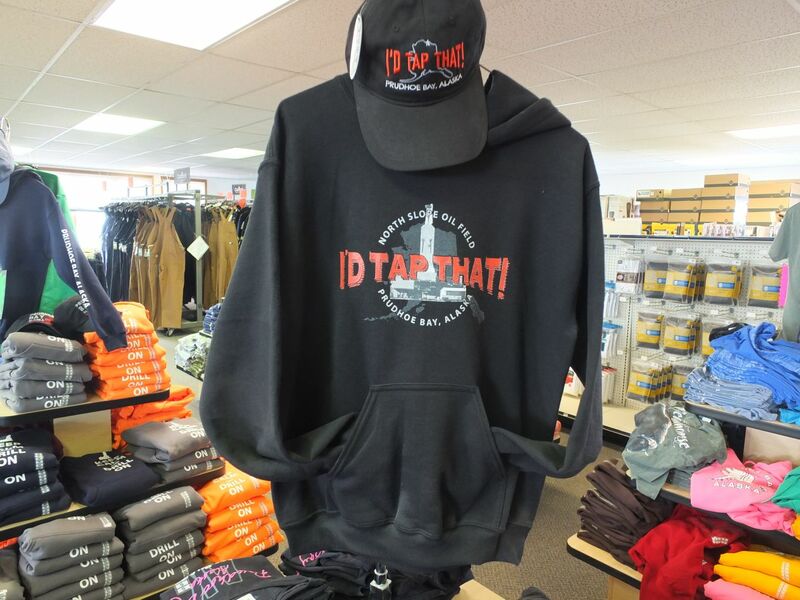 The general store is largely there to sell extra goods to the workers stationed at the oil fields, although the minute number of tourists who venture this far north can also stop here and pick up some souvenirs. 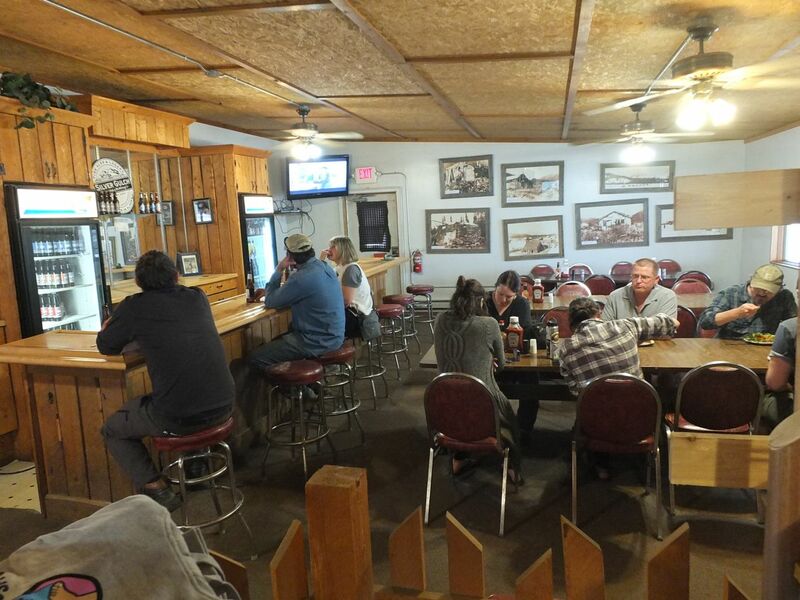 Like everything else, it's located in a prefabricated building made of aluminum and steel, sitting atop the gravel that coats everything in Deadhorse. There's a small amount of food for sale, although not very much because the workers have meals included in their living arrangements. 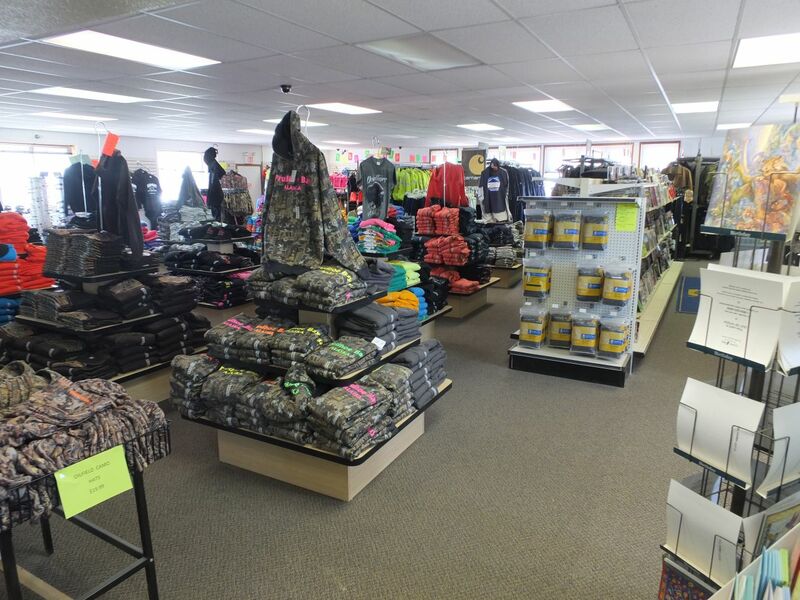 Mostly this store seems to sell clothing and tools, the sort of things that must break or fall apart constantly while on the job. Camouflage and hunting themes seem to be most popular here, although the tour that I went on emphasized that guns themselves are not allowed among the workers for safety reasons. Thick work overalls were being sold off the rack in the same fashion that designer clothes would be sold in an expensive boutique elsewhere. It was one of the more unusual places I've visited in a location that was already profoundly unique. 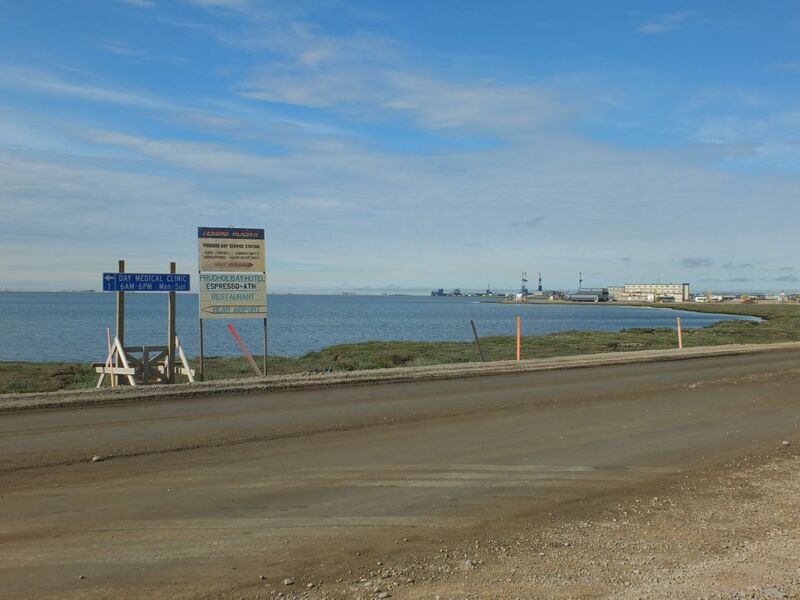 I was staying at the Prudhoe Bay Hotel, where I had booked a reservation ahead of time at an exhorbitant price of $160 for the night. Like in Coldfoot Camp, there are virtually no options on where to stay and the hotel owners can charge an absurd rate. 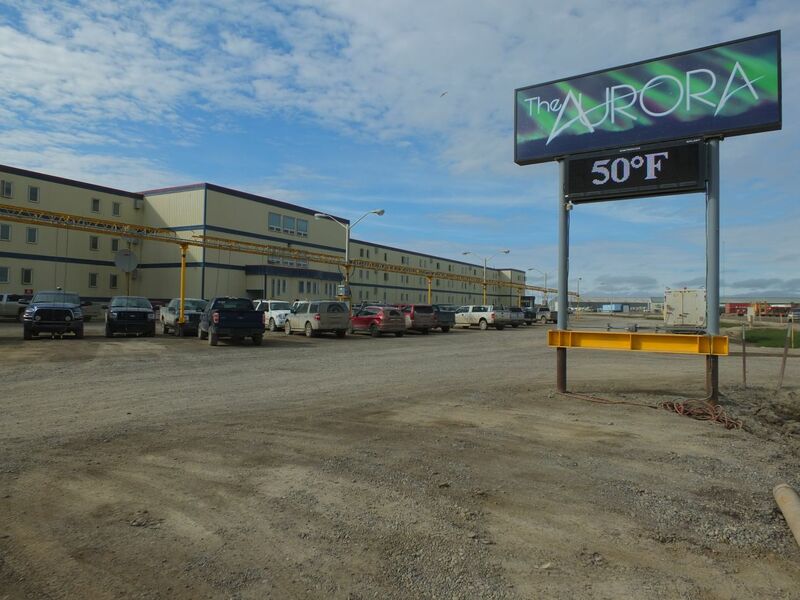 I included a picture as well of the Aurora, another residence for the oil workers, to include the current temperature at the time. Deadhorse sits at just above 70 degrees latitude, and here in early July the temperature was 50 degrees Fahrenheit (10 degrees Celsius) during the late afternoon. It did get a bit colder at night, or should I say "night" since the sun never set, although not as cold as would happen during a normal day/night cycle. Note as well the little dangling power cords in the parking lot of the Aurora; the Prudhoe Bay Hotel had the same thing extending from the front of the building. Those are electrical cords designed to be plugged directly into the car engines to keep the gasoline inside from freezing during the winters. It gets ridiculously cold in this area during the winter, and automobile engines can't operate without taking special precautions to stave off the cold. I was visiting at the hottest part of the year and it was still close to the freezing point. 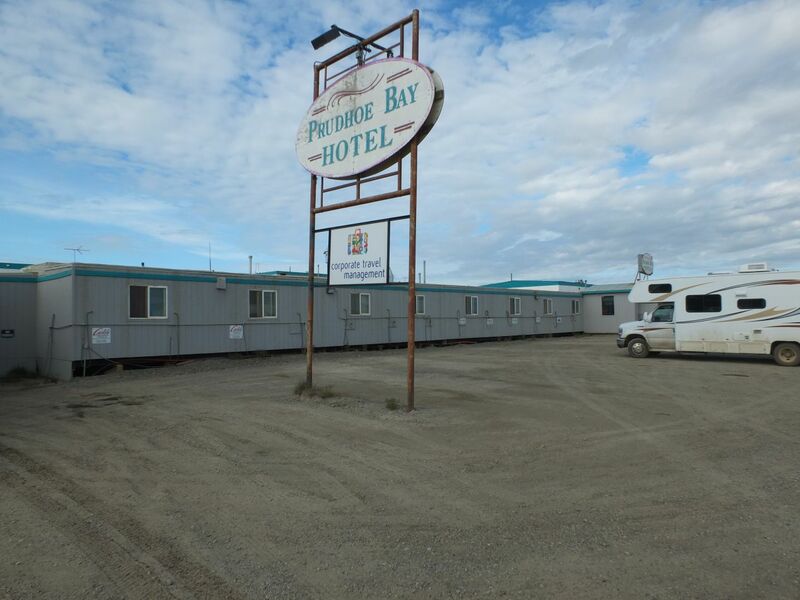 The Prudhoe Bay Hotel had a dingy, dirty exterior that looked like it had seen a few too many winters. Inside was a different story, however, and I found it to be a pleasant place to stay, especially under the circumstances. Entering the building felt like entering a submarine or a space station. The heavy exterior doors brought visitors into the room picture above, which was essentially an airlock of sorts designed to seal off the outside weather. 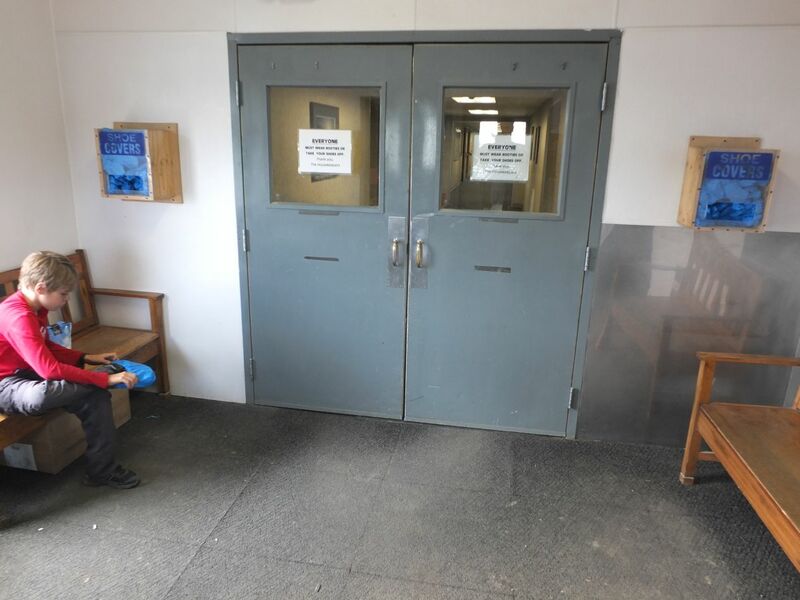 Both sets of doors were not supposed to be open at the same time, no doubt to stop cold air from entering in the winter. I caught a picture of a boy above putting on shoe covers, which everyone was required to wear inside. The inside of the building was laid out like a hospital or a military base, with everything meticulously organized. 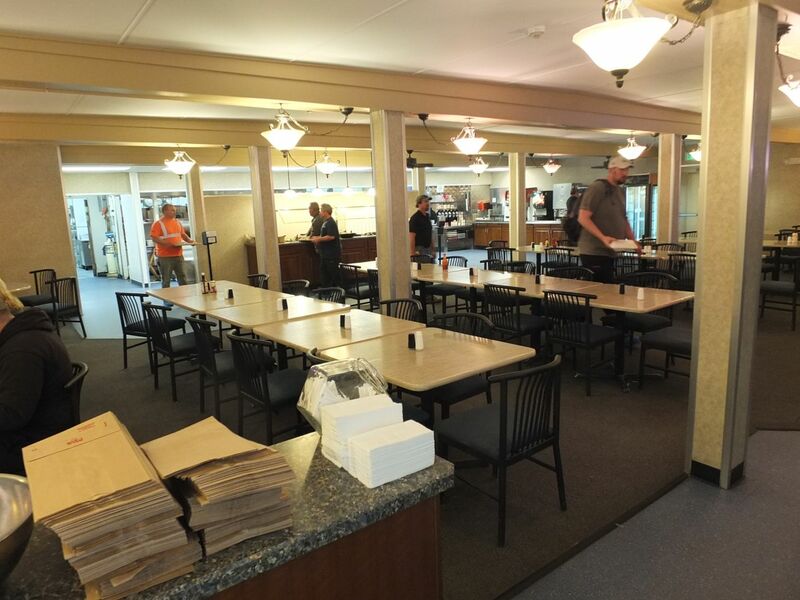 I took a picture of the communal dining area, where meals were again served buffet style in all-you-can-eat fashion. Meals were included in the price of the hotel, and the food here was genuinely good. Lots of options and steak cooked the way you wanted it. 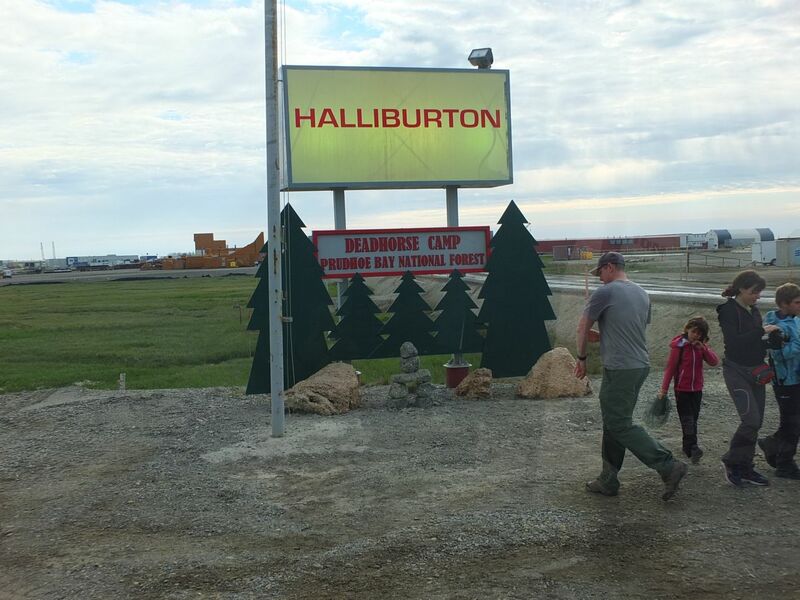 My understanding is that it's good policy to make sure that the oil workers staying here have good meals to eat, and the corporations with operations here ensure that the workers are well taken care of. I was exhausted after dinner and went to sleep quickly, but I made sure to set an alarm for midnight so that I could slip out of the building and take this picture. Here's my homemade image demonstrating the Midnight Sun in action: 12:04 am on my cell phone and the sun clearly shining outside. So what's it like to experience perpetual daylight outside? It's... strange, that's the best way that I can put it. I found that it was easy to lose track of the time of day, since the sun continued to shine at a similar angle throughout the entire day. In a lot of these pictures it looks like it's noon or early afternoon when it was actually 8:00 or 9:00 in the evening. I also found myself staying up longer due to the endless sunlight, which is apparently common for people experiencing these conditions. The converse is true during the nonstop darkness in winter, which can lead to severe depression, and I'm glad I was able to avoid that. I was trying to keep an eye out for the sun while I was above the Arctic Circle, and I was fortunate to have mostly clear weather to track it. Because the sun doesn't set under these conditions, it's possible to watch it trace a circle in the sky over the course of a full day. We're used to thinking of the sun rising in the east and setting in the west, but that's an incomplete picture of what's happening of course. The sun is traveling in a circle, or at least that's the apparent motion caused by the Earth's rotation on its axis, which we can only see half of the time due to the Earth's own mass blocking view of half of that circle. Up near the poles, it's easier to see what's going on. I have to admit that this was still very strange though, especially when I knew that the sun was off to the north or south as it traced that circle! The next morning I was up again for a tour to see the oil fields. 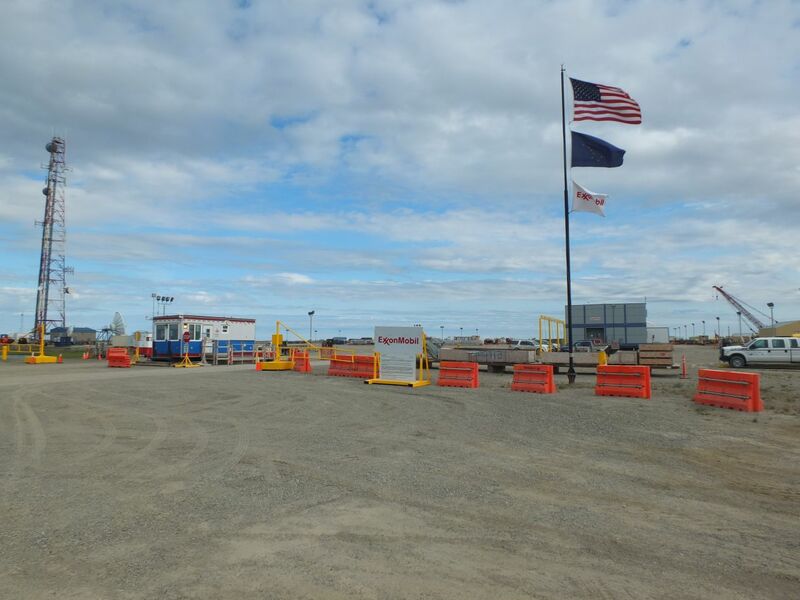 Access to Prudhoe Bay and the Arctic Ocean are off limits to the public, and only by scheduling a tour ahead of time (and providing a surprising amount of security clearance documents) can they be seen. There were seven other tourists on this trip with me: a French Canadian family of four, a couple traveling together, and a solo motocyclist who had done the entire trip up from Fairbanks in a single day. Our guide was one of the workers at the oil fields, and he did an excellent job of explaining what life was like for the workers. They are flown in for shifts that usually last six to eight weeks, working several 12 hour days followed by a few days off. 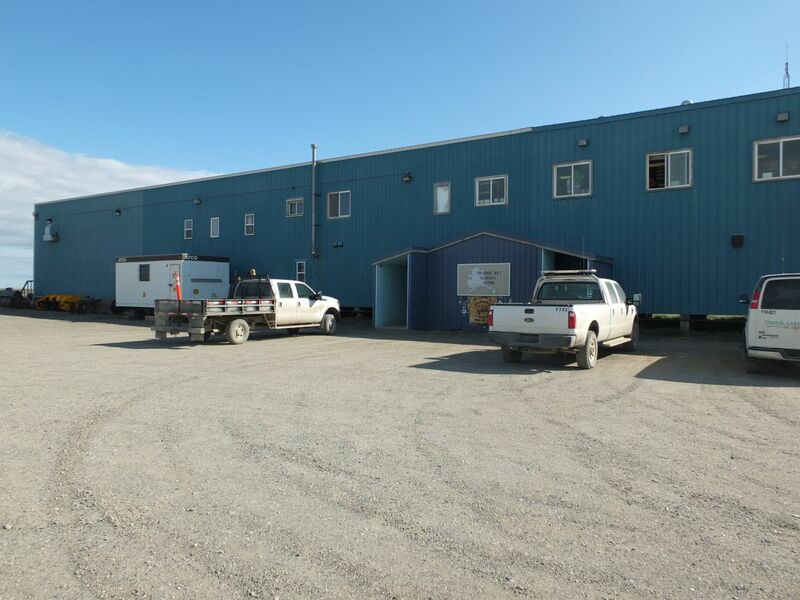 No one lives here permanently, and many workers are separated from their families in Alaska or even further away for long stretches of time. The workers are willing to come up here because the pay is excellent, much better than most other places in the industry. It's a hard job but the compensation is worth it for many of these individuals. 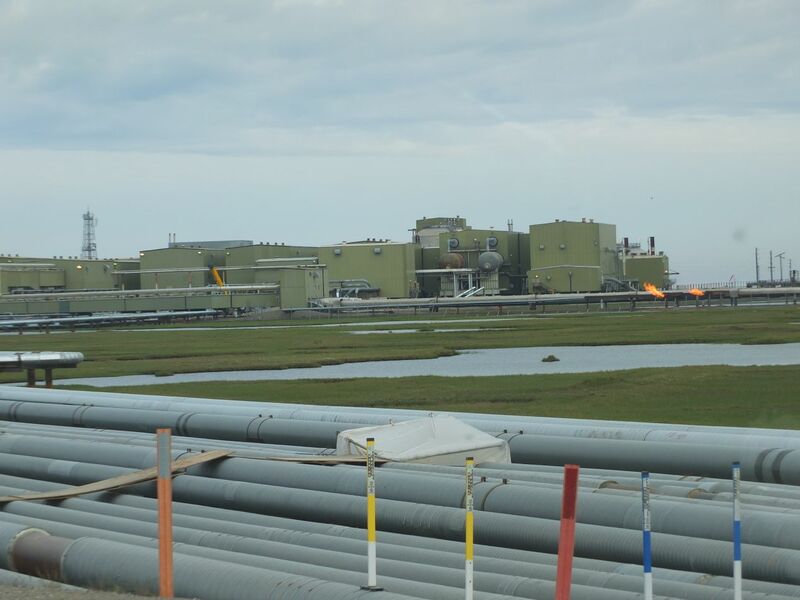 At the time of my visit in 2015, the oil industry in Alaska was hurting badly due to competition from cheaper natural gas, hydraulic fracking, and the continued rise of renewable sources of energy like solar and wind power. This situation has only gotten worse in the years since. 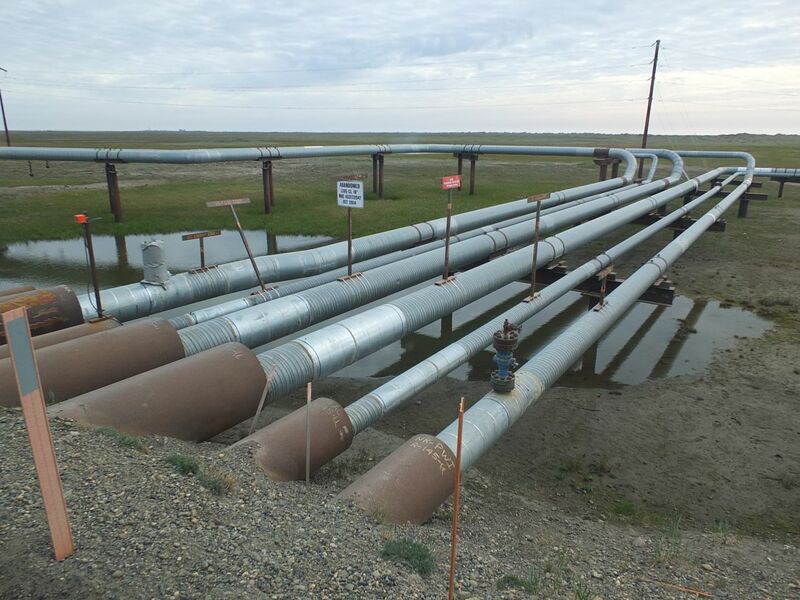 The amount of oil being produced and sent south along the Alaska Pipeline has declined by about 50 percent since the 1990s, and there are real questions about the economic efficiency of producing oil from such a remote region. I wonder what this is all going to look like in another two or three decades. Will any of this still be in operation then? This tour didn't take us inside any of the oil buildings themselves. From the outside, they looked like any other industrial buildings: big warehouses with pipes running everywhere and smokestacks billowing out toxic fumes. The green building picture above had flames shooting out in a couple places as something was vented into the outside air. Pipes snaked all over the place, each one labeled to indicate what was running through it. 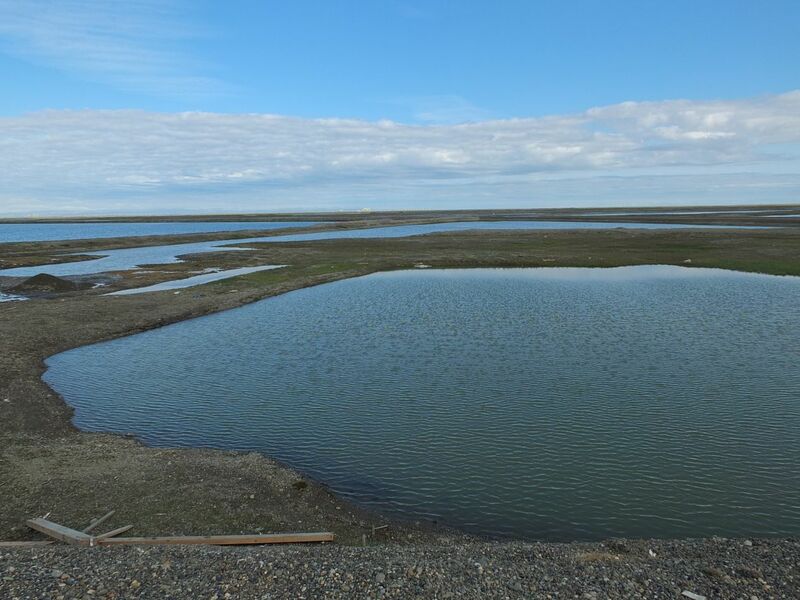 Because of the permafrost lurking just under the tundra, nothing could be placed below ground, and therefore all of the sinews of industry were lying out in the open in plain view. Since I'm not an engineer and have never worked in the field of natural resources, I couldn't begin to guess what this machinery was designed to do. Pump oil in some fashion, I suppose. 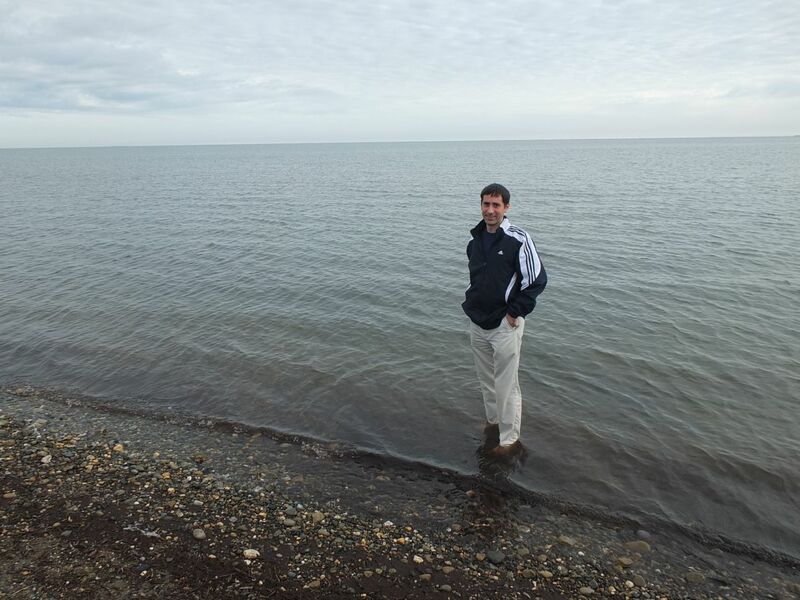 The highlight of this trip was a stop at the Arctic Ocean, in the mouth of Prudhoe Bay itself. 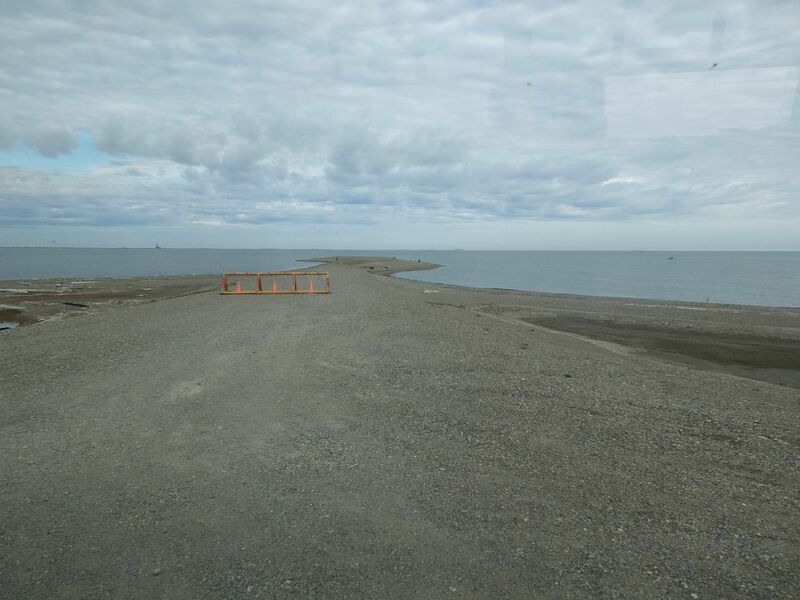 Our bus pulled to a stop at the end of another gravel road, on a small spit of land jutting out into the huge body of water. Off in the distance, we could see offshore oil rigs engaged in dredging up more crude oil from beneath the ocean's shallow floor. The beach itself was rocky and flat, with little in the way of sand but plenty of scattered driftwood bleached white by the sun. Unlike many other beaches that I've visited, there was nothing in the way of tourist attractions, no stores or shops or boardwalks. There was also nothing in the way of plant life here, no grasses or trees or anything green and growing. The only things present were various pieces of industrial machinery stowed further along down the beach. Under an overcast sky and sitting next to the slate-gray waters of the Arctic Ocean, this was one of the most desolate spots I can remember visiting. But it was still the world's northernmost ocean, and it had been a lifelong dream of mine to visit this destination ever since I stared at a world map as a child. I had the chance to wade into the frigid waters and have my picture taken, and you can see from my face just how good this all felt. (I had also picted up a stomach virus the day before and wasn't at my best.) I can still find the exact location on Google Maps where this forelorn beach is located, when I traveled to the utmost ends of the Earth and came back to tell the tale. It's a story that I'll always remember. That still left the journey back, of course. 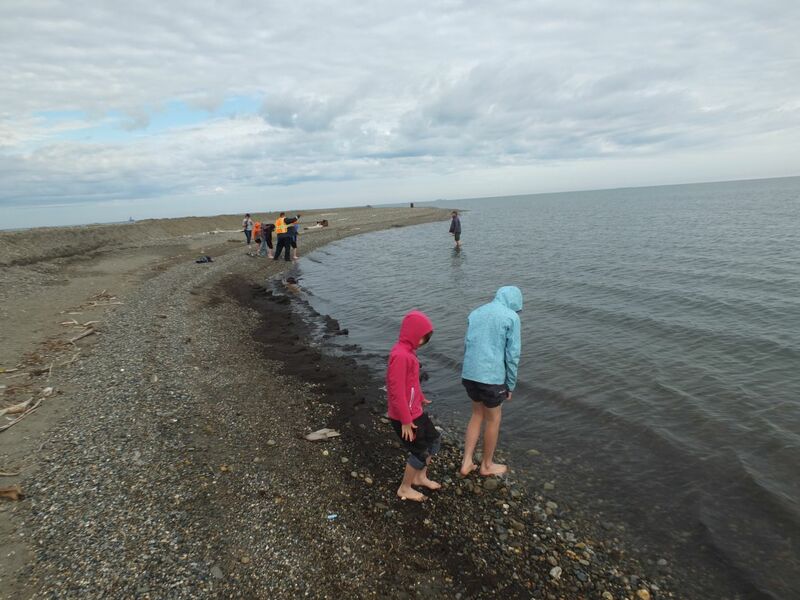 From that beach on the Arctic coast, I had a drive of some 800 miles south to Anchorage, followed by a series of flights to return back to my home. 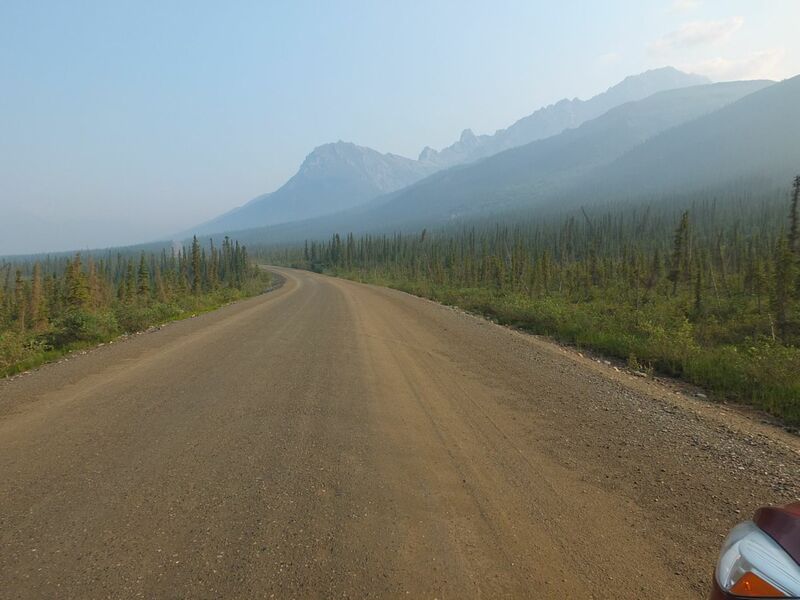 The first leg was the trip back to Coldfoot Camp; I had feared this would be boring, and fortunately it was anything but. 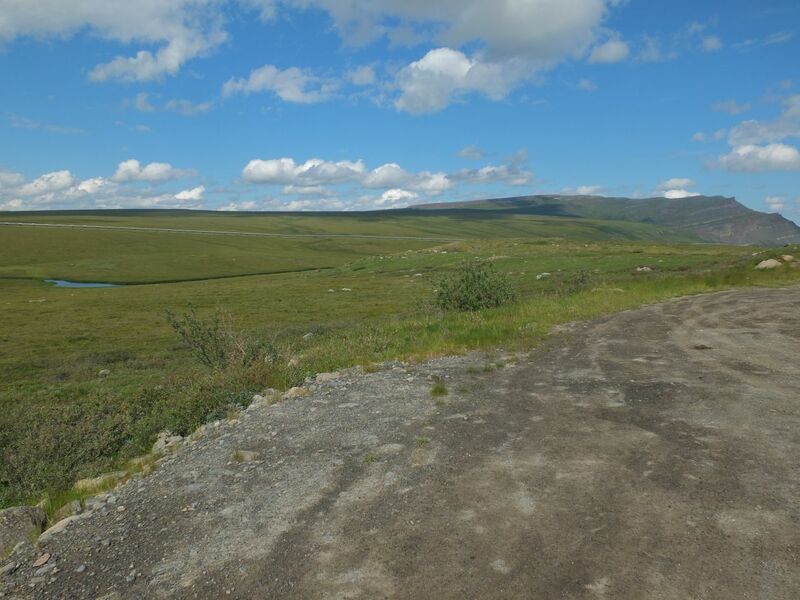 The skies cleared up on this day, and my return through the tundra took place under bright sunlight, which cast this terrain in a completely different light. Now it felt like I was traveling through the Great Plains of America, albeit in a much colder climate. Crossing over the Brooks Range once again could have been crossing the Rocky Mountains, with the way they rose up out of the surrounding flatlands. It was a pleasure to see the appearance of trees again on the southern side of the mountains, and the life seemed to return to the landscape as I ventured further and further south, retracing my same steps from before in the opposite direction. I stayed another night in Coldfoot Camp, once again paying for meals and the use of their showers without booking a hotel room. There was a clear sky all "night" in Coldfoot, and the low angle of the sun during what would normally have been nighttime hours cast the shabby buildings in a soft glow. In the picture above, the rundown place actually looked kind of beautiful. 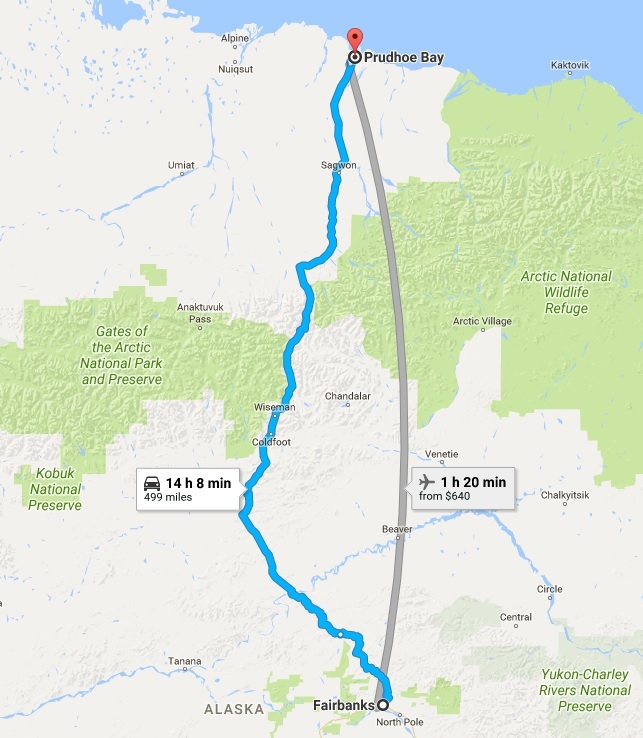 This was also the location of my one great regret from my Alaska trip: I had booked a flightseeing tour that was supposed to fly over Gates of the Arctic National Park and land at Anaktuvuk Pass. This night had the most perfect weather for that flight tour, and the scenery would have been incredible. However, the camp only runs that tour if they can get at least four people to sign up, and there weren't enough on this particular day for the tour to take place. This was a bitter disappointment; I had also tried to take the same tour two days earlier on my previous stop at Coldfoot, and there hadn't been enough people signed up on that day either. I guess there just aren't that many tourists passing through. Like I said, this is my one great regret from this trip, and not due to anything I could control. I made the rest of the journey back to Fairbanks on the following day. 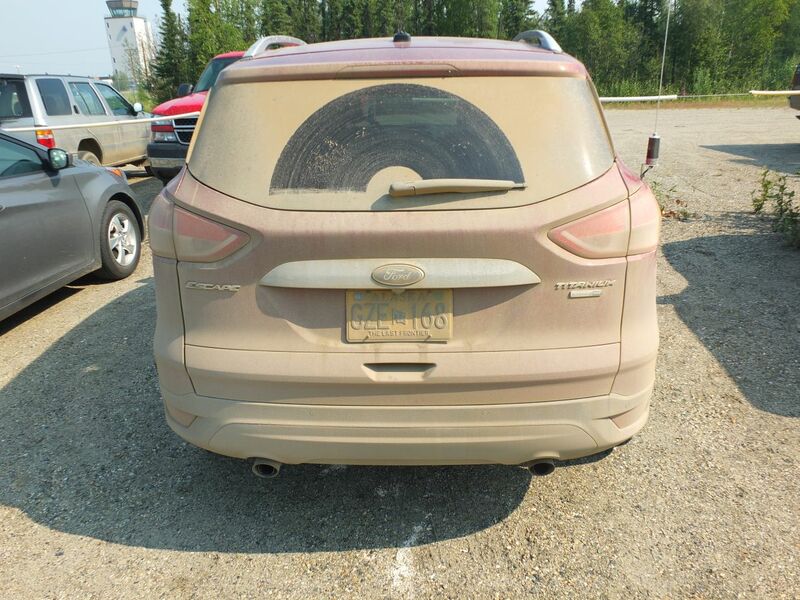 The picture above of my rental vehicle when I returned it should provide an indication of the toll that the Dalton Highway had taken on it. 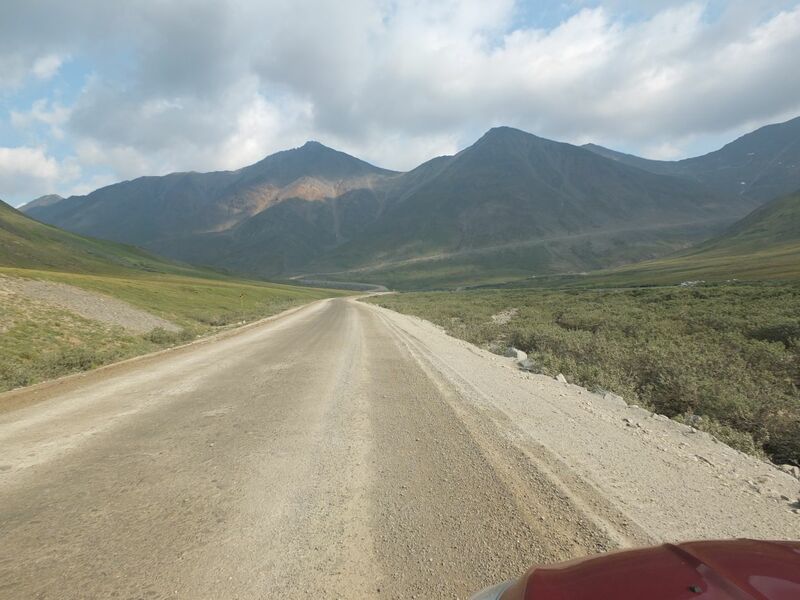 Compare to the top of the page to see what four days of driving along rough roads will leave behind! There's a good reason why normal rental cars aren't allowed on the Dalton. The rest of the day was spent sightseeing around Fairbanks, with details covered on the previous page. 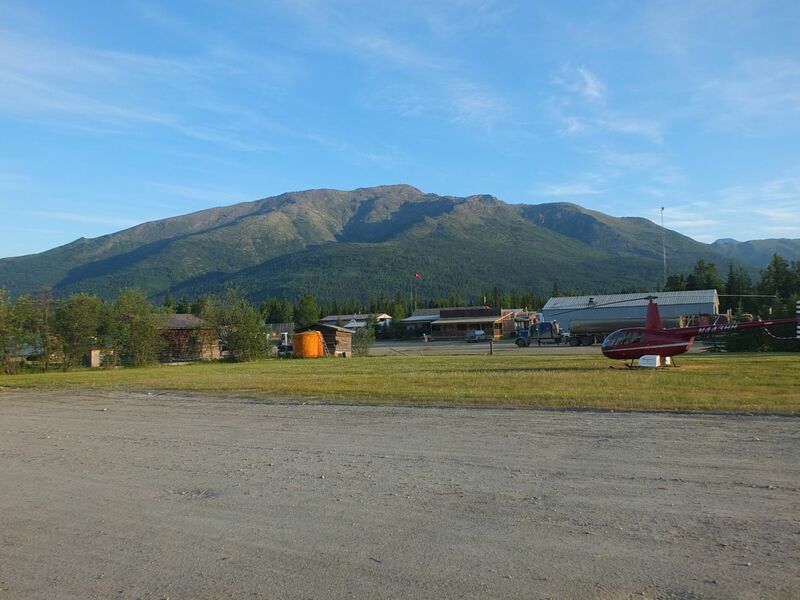 On the following day (July 4th), I was up at 3:30 am to ensure that I would be back in Anchorage in plenty of time to make my flight that afternoon. 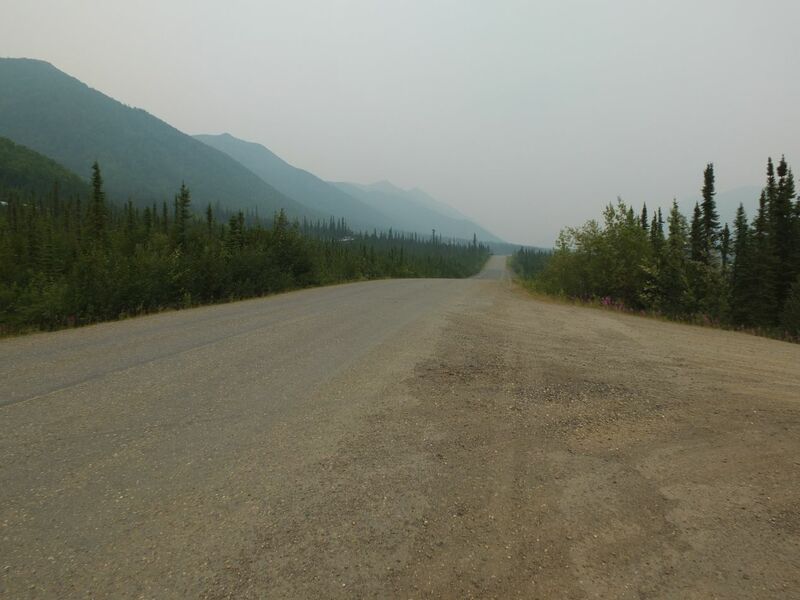 It takes roughly six to seven hours to drive from Fairbanks to Anchorage, and I've traveled enough to know that many things can go wrong on a trip like that. Sure enough, I received a text message en route that my flight had been delayed, which was no good since it would prevent me from making my connecting flight. 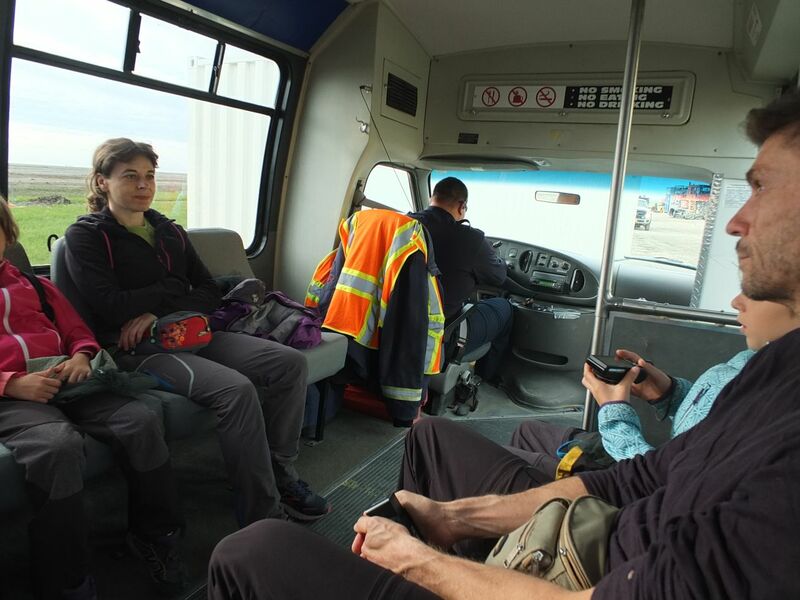 By getting to the airport in Anchorage by 11:00 am, I was able to take an earlier flight that connected through Seattle, and then through San Francisco, which would get me back to Baltimore as planned. The net result was that I drove 400 miles and then took three different flights before arriving back home completely exhausted on a Sunday morning. That was not the most enjoyable day I've ever spent, but I made it back in one piece. All told, what an amazing trip. The ten days that I spent in Alaska were among the most incredible experiences of my life. Aside from missing that one flight tour, I couldn't have asked for much more in the way of good luck. If anyone reading this is interested in traveling to the 49th state, the one overriding thing that I can recommend is renting a car and getting out to see some of these places firsthand. Don't limit yourself to a cruise ship if at all possible - get out there and see the wilderness for yourself! Thanks for reading.